​Welcome to our new page dedicated to some of the Classic Reel to Reel tape recorders. This list is not intended to contain all the models that were built and it focuses mainly on high performance home recorders. 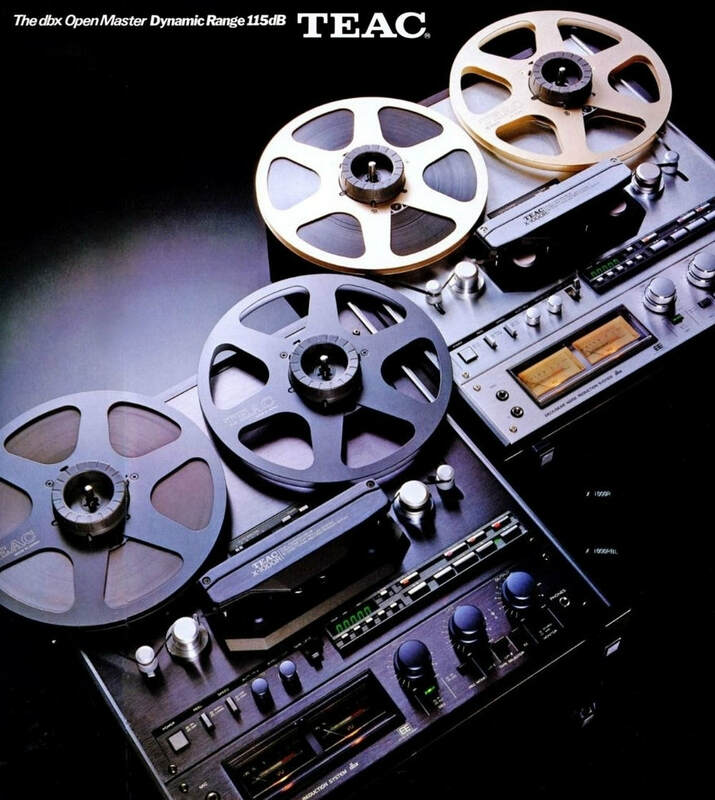 But don't worry, because you will see some interesting reel to reel tape recorder models that you might have never heard of despite being popular in some parts of the world. Where it all started, the world first magnetophon (tape recorder) as we know it today. 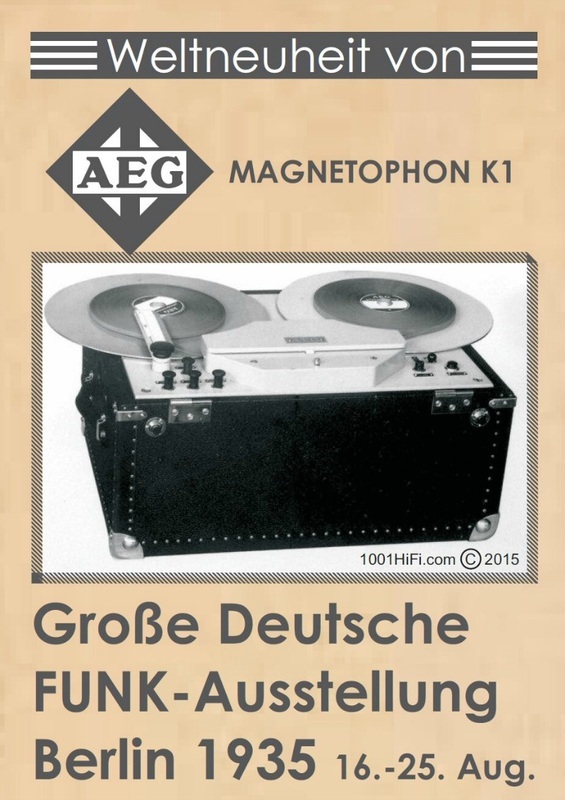 The AEG MAGNETOPHON K1 was a 3 motor 3 head machine using the MAGNETOPHON C1 tape developpend by BASF for AEG. 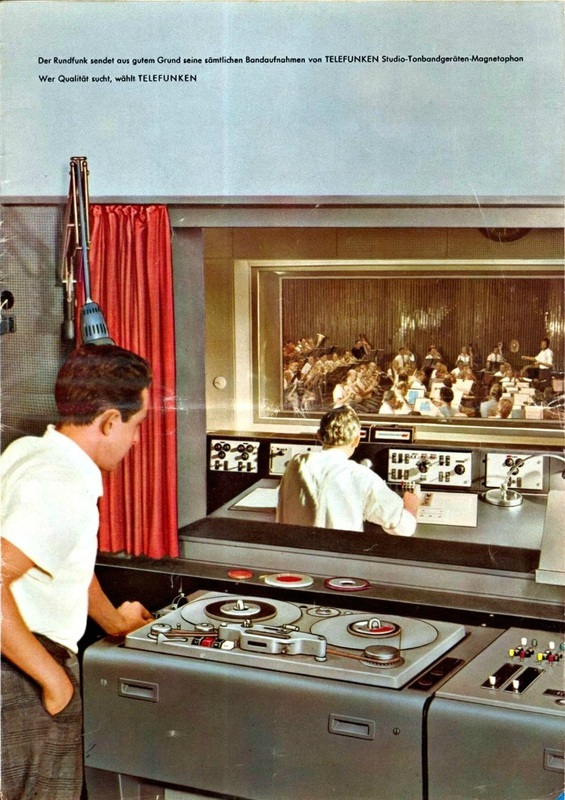 The first recording was made in november 1936 with Sir Thomas Beecham conducting the London Philharmonic at BASF's concert hall. 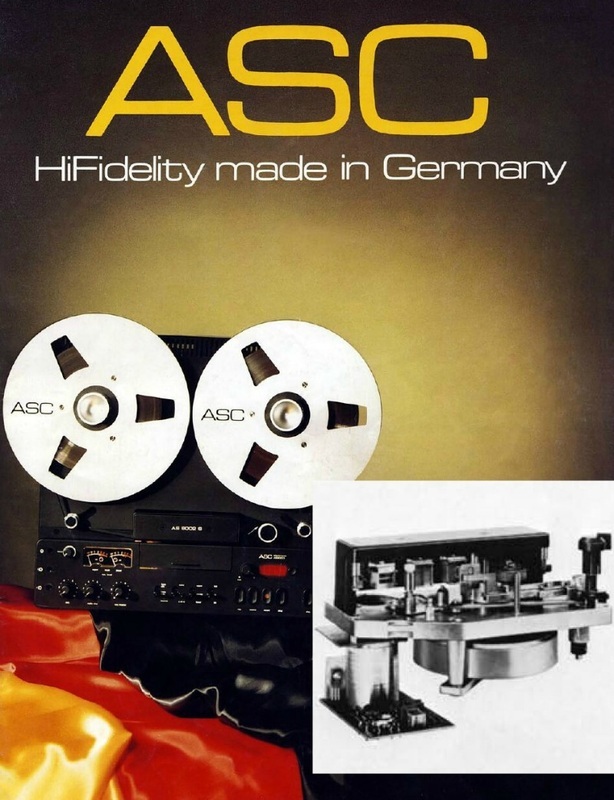 This was a poor recording but tape improvements, such as BASF's ferric-oxide tape in 1939 and an accident that led to the application of high-frequency AC biasing further improved the tape recording performance. ​The AKAI GX-650D was introduced in 1976. 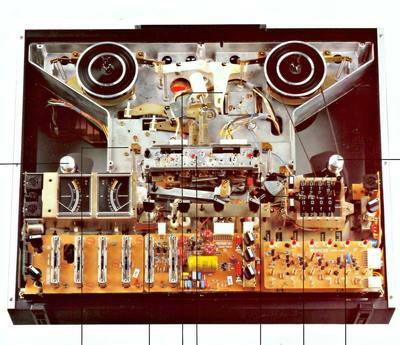 It's a 3 Head, 3 Motor stereo tape deck featuring an efficient Closed Loop Double Capstan AC Servo Motor system. 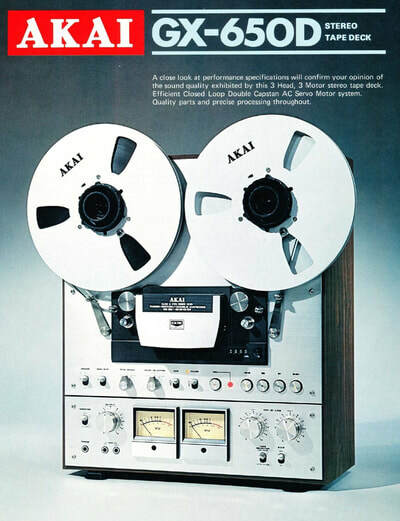 The recording and playback heads of this model are AKAI's famous GX (glass and crystal ferrite) heads. The special construction of this head eliminates sound drop-out, improves head sensitivity, and minimizes high range loss for a more dynamic range with vastly improved high range frequency characteristics. Also signal-to-noise ratio is improved and distortion minimized. 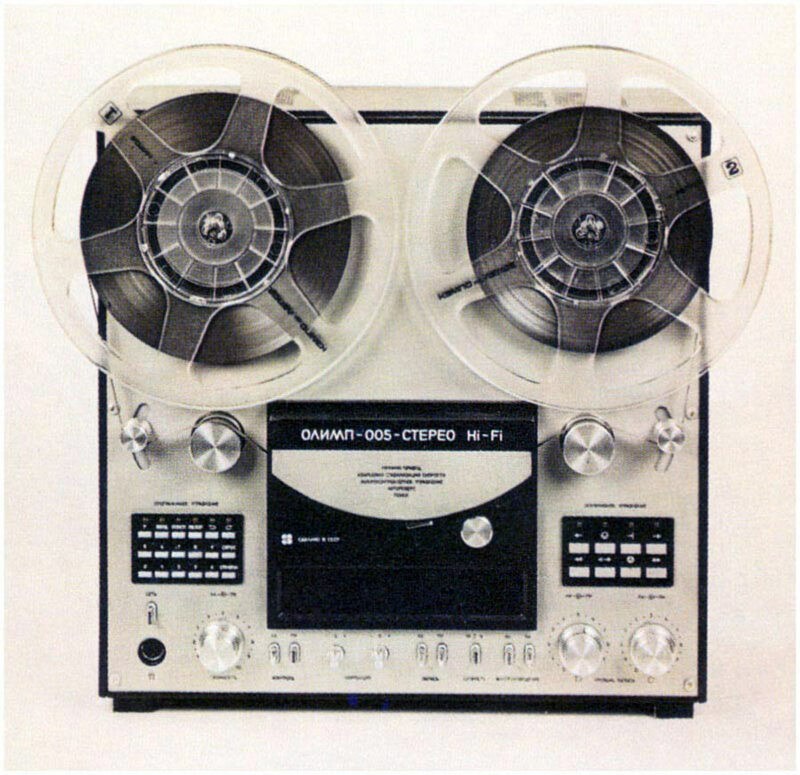 The GX-650D operates on 15, 7-1/2, and 3-3/4 ips tape speed. 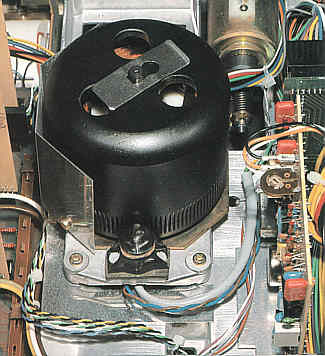 AKAI's exclusive CPG (center pole generated) system inner-rotor AC Servo Motor is employed in this model for double capstan drive. With this system, the voltage supplied to the stator winding is pulse detected and precisely controlled for stabilized motor revolutions and constant tape speed. 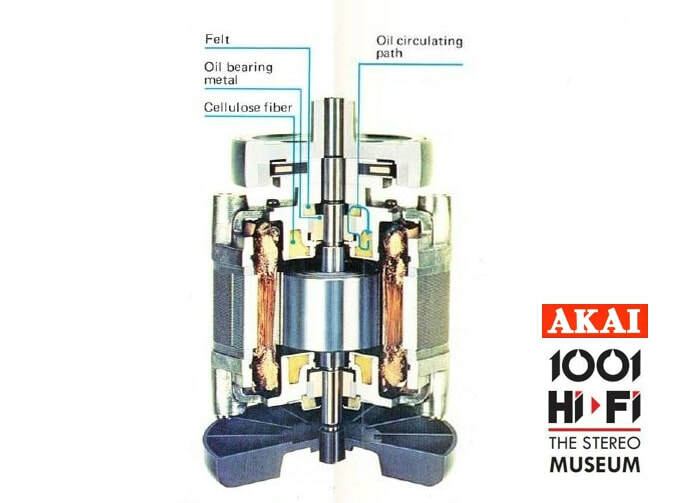 Two oil circulating mechanisms with cellulose fibers are installed within the interior of the motor. 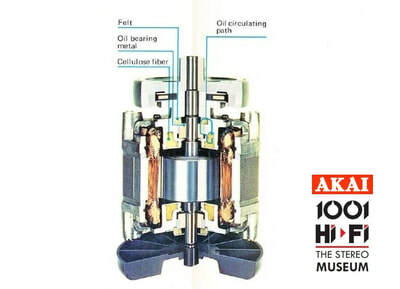 This oil-circulating system assures smooth and stable shaft revolutions. 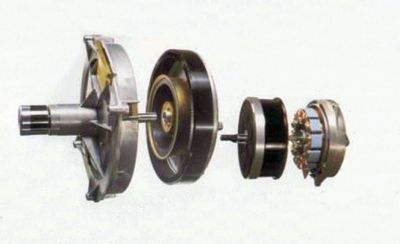 Two 6-pole eddy current anti-vibration outer rotor reel drive motors complete the perfect drive system of this model. 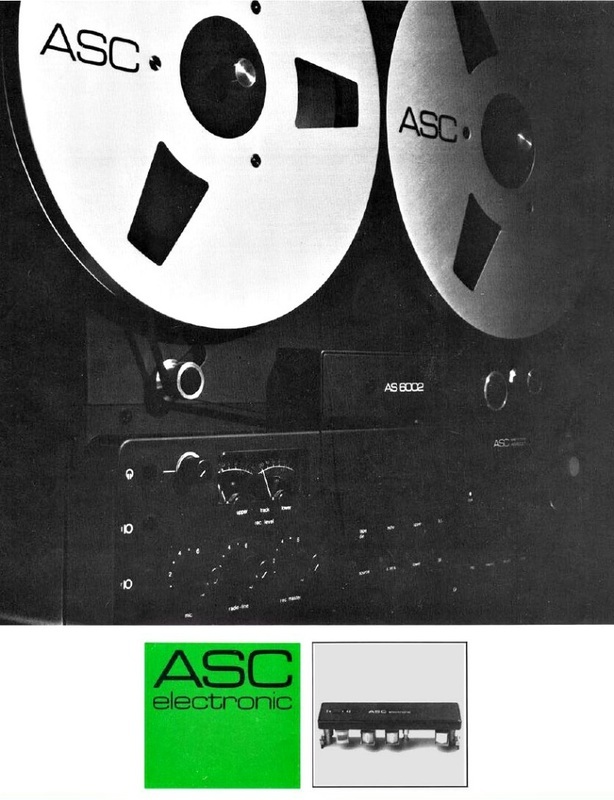 Technical data: Track system - 4 track 2 channel stereo/mono system, Reel capacity up to 10-1/2", Wow/Flutter less than 0.04% RMS at 15 ips, Frequency response 30 to 30,000 Hz +/- 3 dB at 15 ips, Signal-to-noise ratio better than 58 dB, Dimensions 524 (H) x 442 (W) x 258 (D) mm, Weight 26.2 kg. 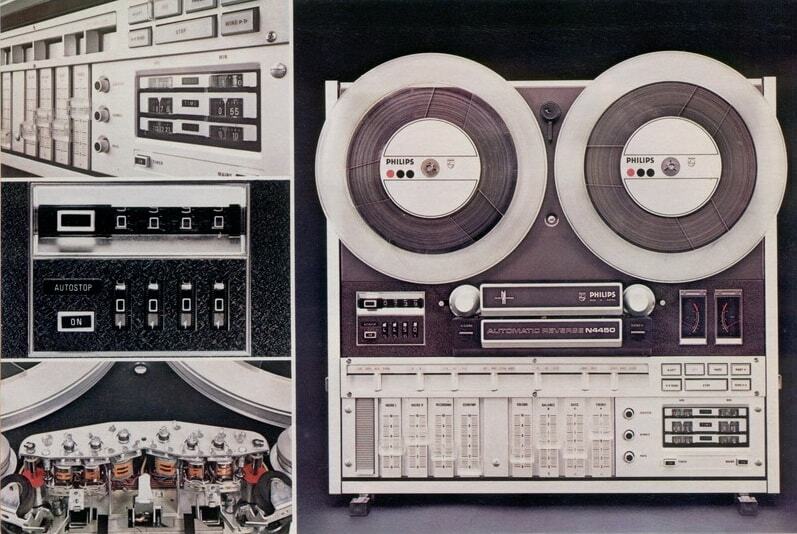 GX-646 (and it's previous versions) but it is probably the most well remembered tape recorder of all time. It was available in silver or black with LED meters and the dbx version, the GX-747dbx, only available with VU meters in silver or black. It has a solid 3 motor Direct Drive mechanism using the famous AKAI GX heads in a 2x3 head configuration. 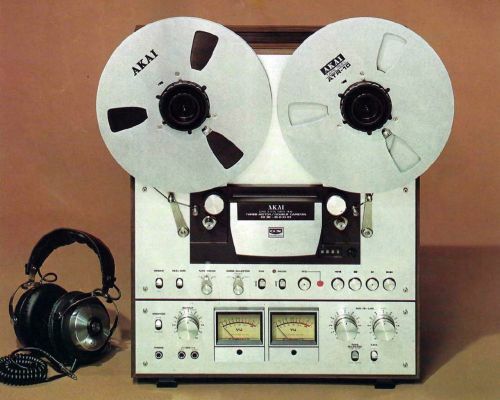 ​The AKAI GX-747 is an autoreverse machine with bothway recording capability so there are a total of 6 heads (including 4 GX heads) that can also handle EE tapes. 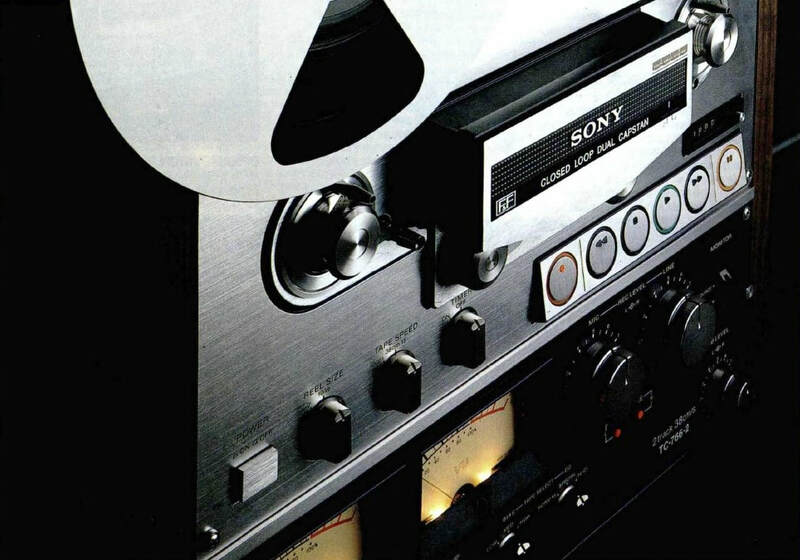 Extra Efficiency (EE) tapes were the last development in tape technology using CrO2 tape formulation. Best results can be achieved with any tape with the help of the BIAS adjust while for easy tape locating there is a digital counter with hour/min/sec display. Frequency response is 25Hz-33 kHz at 19 cm/s. 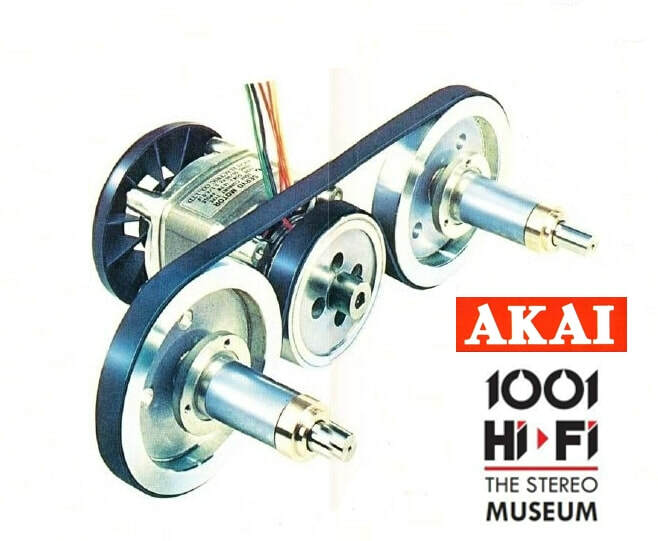 See more AKAI in our collection here. 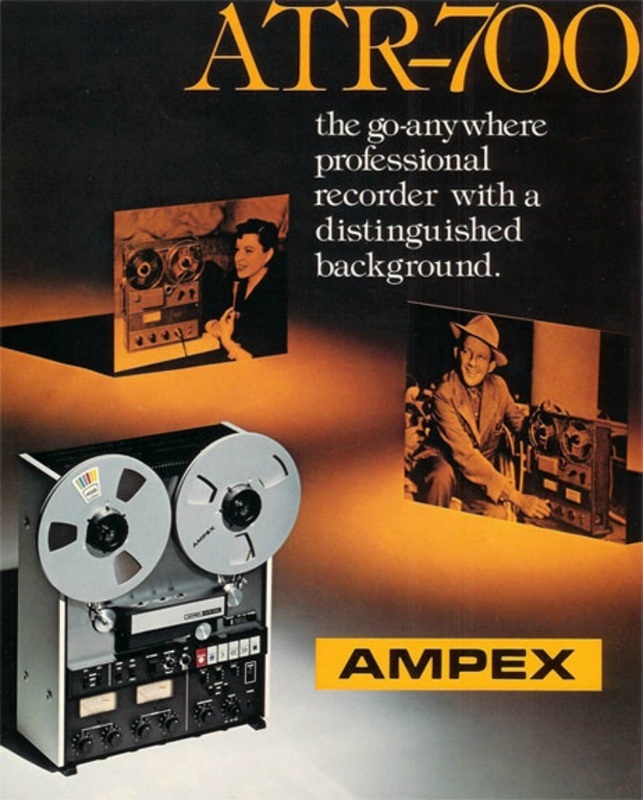 ​The AMPEX company was estabilished in 1944 in San Carlos, California, USA by Rusian inventor Alexander Matthew Poniatoff. AMPEX's first great succes was a line of reel-to-reel tape recorders developed from the German MAGNETOPHON (see above) with the help of Major Jack Mullin (who brought the MAGNETOPHON to America) and Bing Crosby (a major radio star of the time) who wanted to pre-record his radio programes. 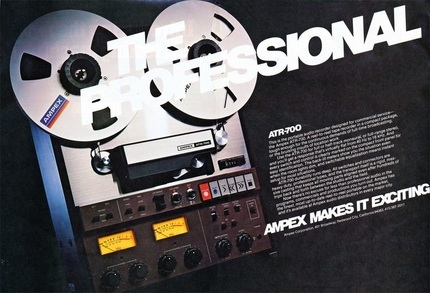 Although AMPEX became a leader in audio tape technology one of their successful models, the AMPEX ATR-700 was built by TEAC of Japan. It was an almost identical unit with the TEAC A-7300. The AMPEX ATR-700 is a 3-head configuration tape recorder available in full track, 2-track and 1/4 track version with a choice of 2 speed pairs. It has a 3-motor tape drive system with capstan-servo D.C. motor with full IC logic circuitry and feather-touch transport controls. Handles 10 1/2", 7" and 5" reels with with switchable reel size tension selector and separate 3-position switches for BIAS and EQ. Frequency response is 30Hz-26 kHz (+/- 3dB) at 15 ips and 30Hz-24kHz (+/- 3dB) at 7 1/2 ips. The BRAUN TG 1000 was introduced in 1970 with a design signed by Dieter Rams. It features a smooth running three motor transport which electronically regulates current to the torque motors. There is just about zero tape tension at the capstan which acts as a metering device, neither pulling nor pushing the tape across the heads as in most machines. Tape tension remains constant for both large and small hub reels so there is no undue head wear from the high torque on an empty reel and no poor head contact with full reels. 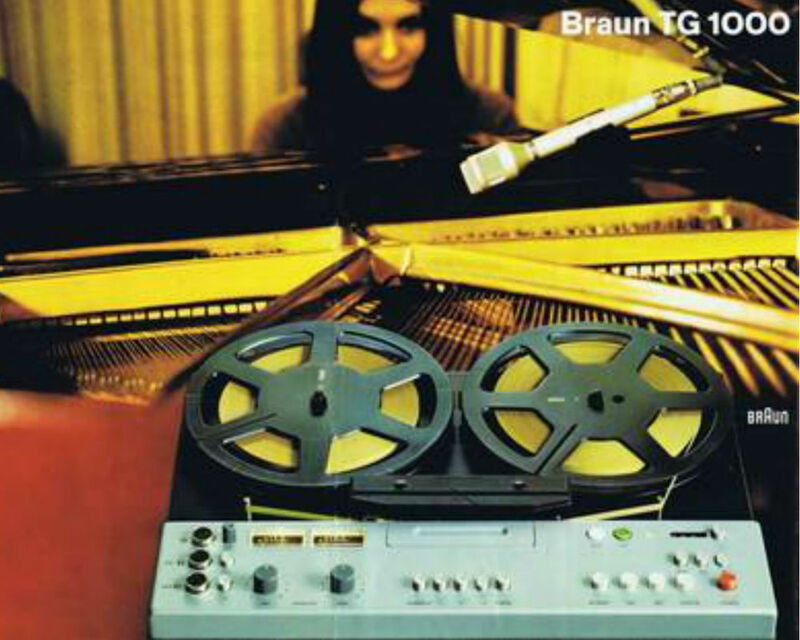 The BRAUN TG 1000 has a die-cast aluminium head base (2 track) for excellent tape running and quiet operation. 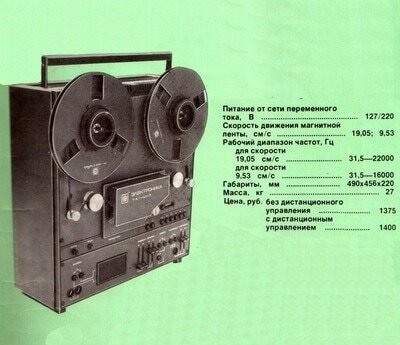 The only drawback of the tape recorder was that the maximum reel size was 22 cm, used by very few manufacturers on models like the ​SABA 600SH or later by some Russian reel to reel tape recorders. Frequency response 20 - 25.000 Hz at 19 cm/s. ​The DENON DH-510 was introduced to the Japanese market on may 6th 1978. 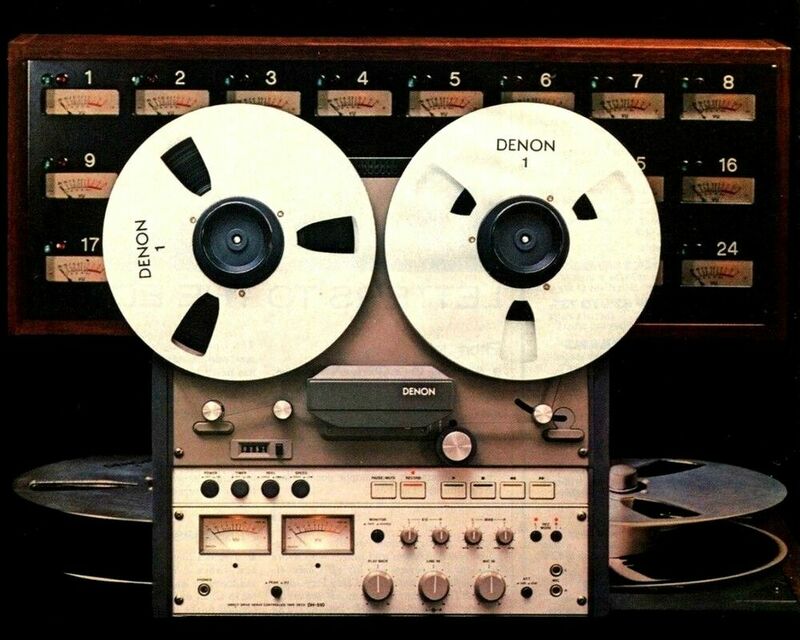 It was a downsized version of the DENON DH-610, intended for home/studio use with a 3 motor direct drive logic controlled mechanism using a 3 head 2 track 2 channel configuration. 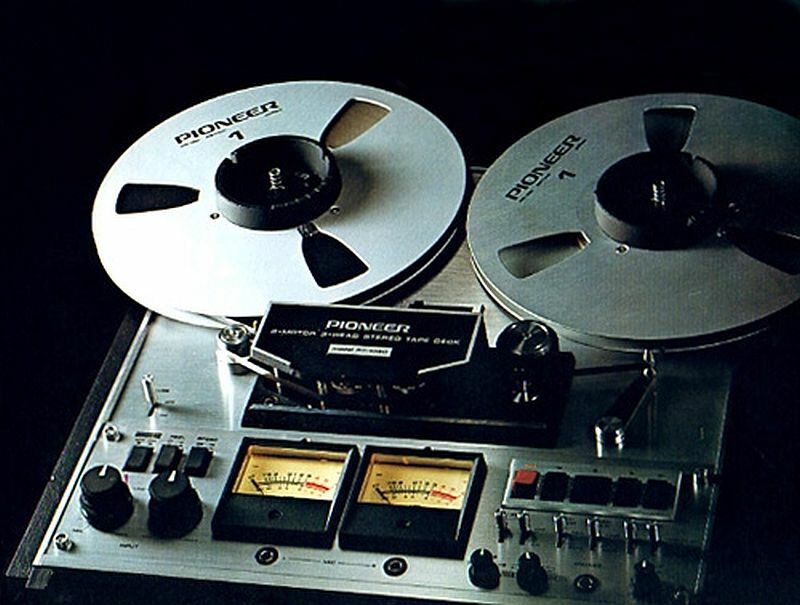 High quality recordings can be achieved using 38 cm/s tape speed for a 30-30.000 Hz frequency range. 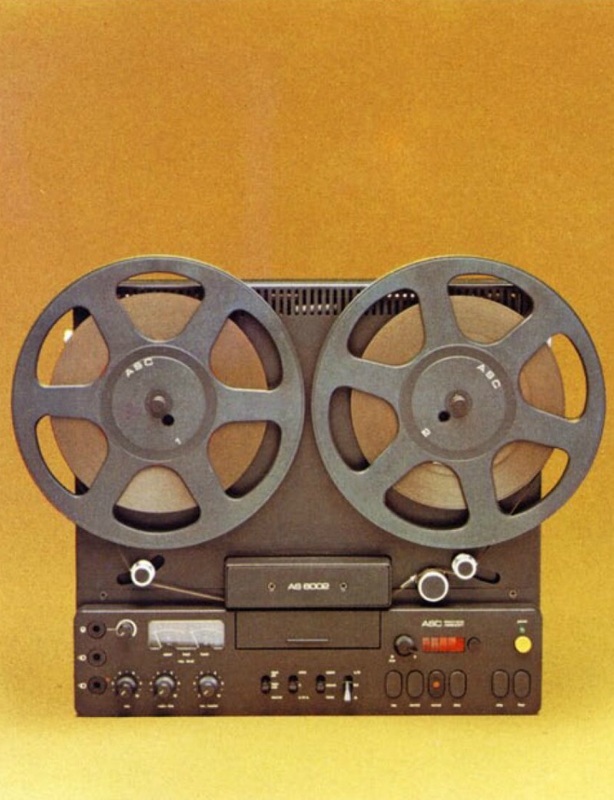 Frequency response using ​19 cm/s tape speed is 20-25.000 Hz. 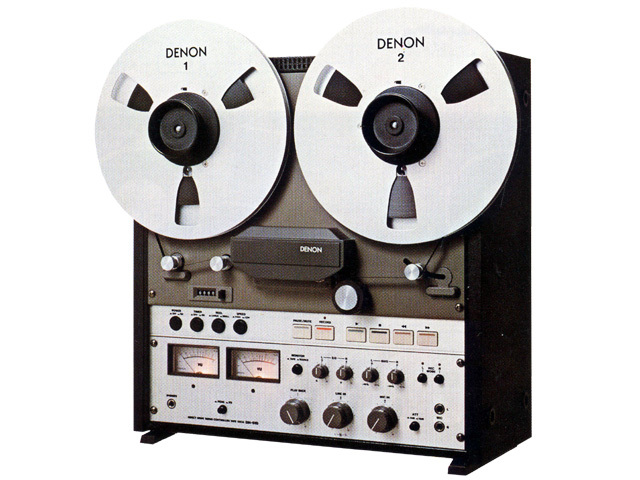 The DENON DH-510 was manufactured until 1981. 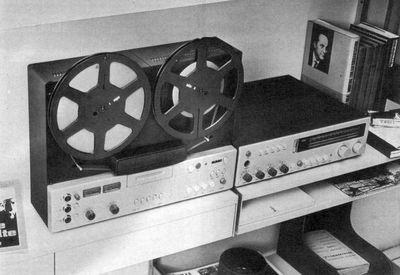 One of the top reel to reel recorders from the former Soviet Union was the ELEKTRONIKA TA1-003 from 1980. 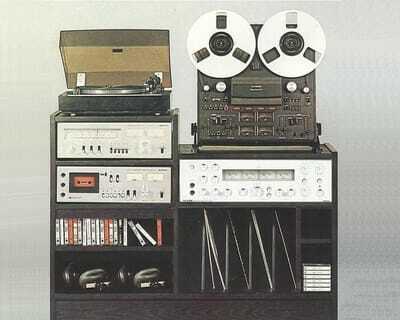 With a tape path and tension arms that remind you of the REVOX A700 it was also available as OLYMP 003. 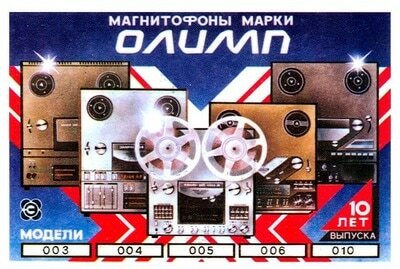 One interesting feature is the fluorescent VU meter, a Soviet "speciality" used in many audio recorders. It's a 3 motor direct drive, stereo autoreverse reel to reel recorder running at 19,05 and 9,53 cm/s. 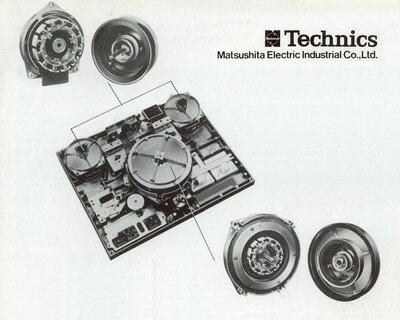 Frequency response using 19 cm/s speed is 31.5 - 22.000 Hz. 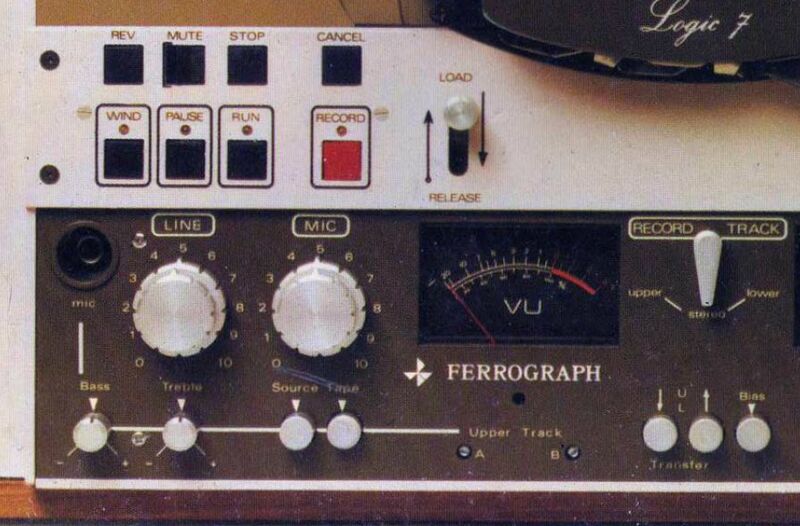 ​Logic 7 recorders from Ferrograph were high quality British machines. Models available were the 7602H 1/2 track stereo recorder, 7604H 1/4 track stereo recorder, 7622H 1/2 track with power amplifiers & loudspeakers and 7624H 1/4 track with power amplifiers & loudspeakers. The A suffix models were for 117V, 60Hz machines while the D suffix models were equipped with Dolby-B noise reduction. Recording quality was excellent using three heads and separate amplifiers for record and play. Two large, illuminated VU meters read recording or replay levels or the bias (which is adjustable for each channel). 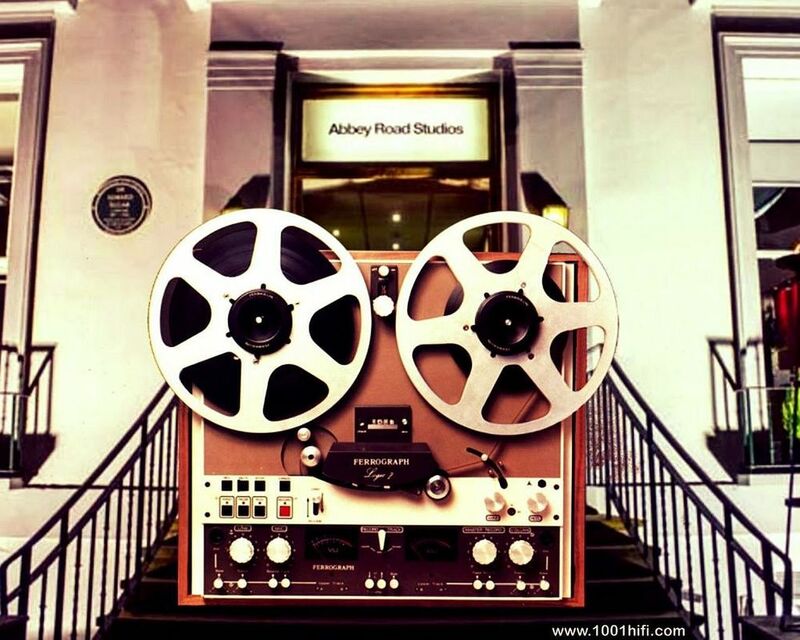 Multiple recordings can be made in mono using the track transfer facilities and eletronic echo can be added to mono or stereo recordings. 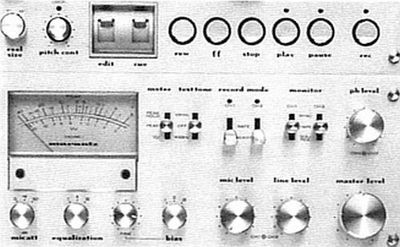 Input mixing allows microphone and line signals to be set individually for each channel and faded up or down with a Master control. ​The marantz Model 7700-2 is a unique tape recorder that was never mass produced for the general public. 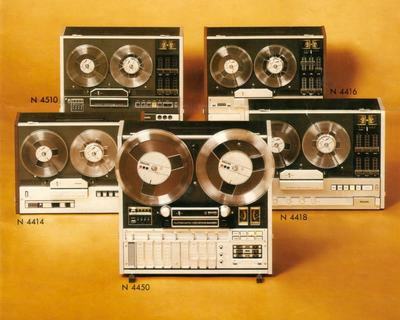 It only made a few appreances at audio fairs like the Japan Audio Fair from 1978 or the Consumer Electronics Show from Las Vegas. 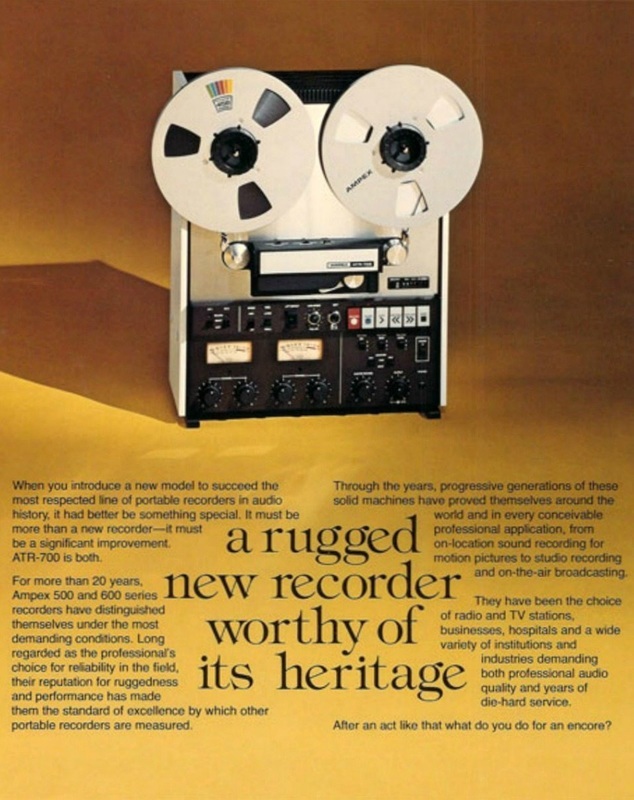 A few audio magazines (USA, Germany) gave more details about this special model that came much too late from a company that has never manufactured a reel to reel recorder. 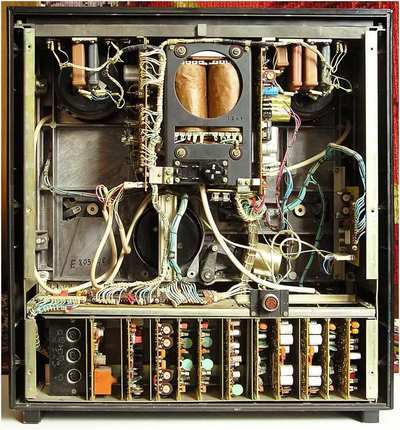 Only 10 machines were built in the Japan depelopment laboratory. 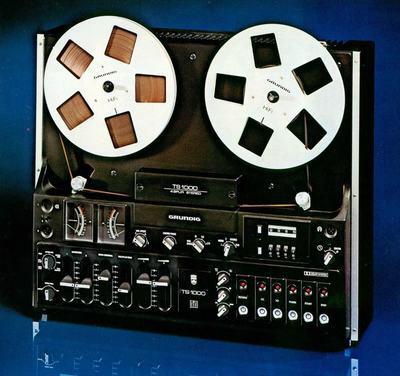 The marantz Model 7700-2 was a 3 head 3 motor dual capstan construction tape recorder. Fast winding of a 26 cm reel tape was 130 sec with fast start/stop times achieved via an electronic and mechanical break combination. 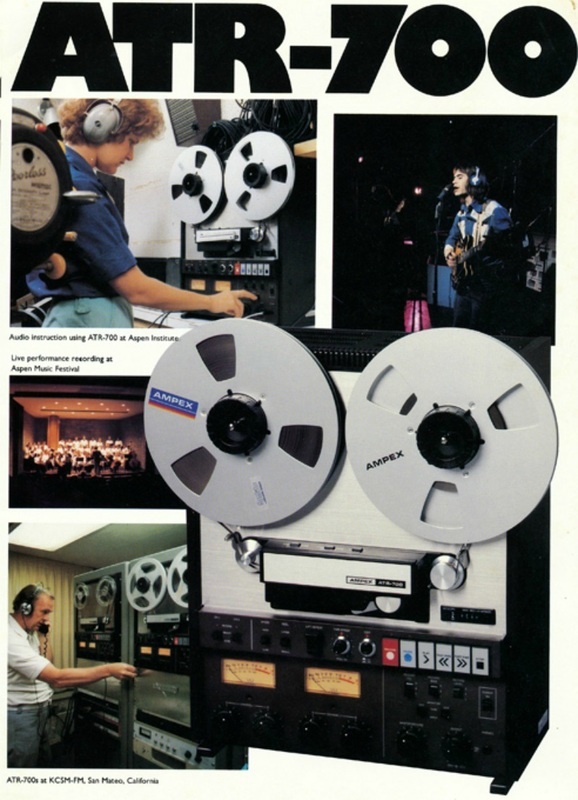 Recording was only possible in 2 track mode but the HBA-2 head assembly had also a 4 track head but for playback only. 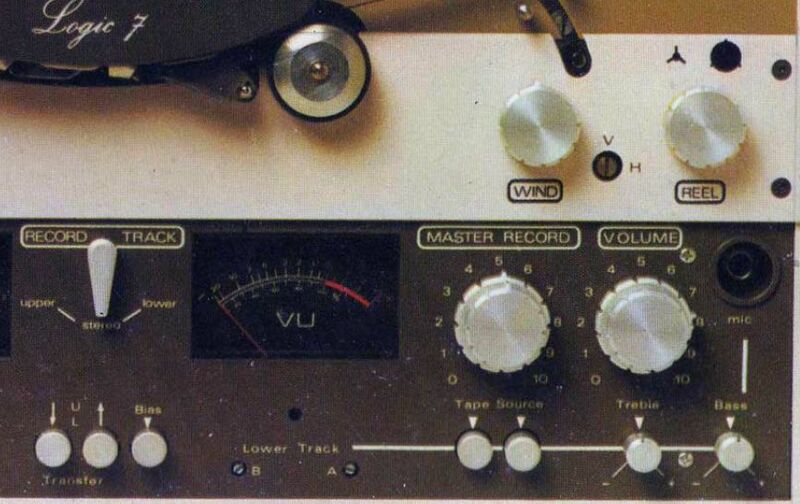 For optimal recording settings there was a built in test oscillator with 400Hz and 10,000 Hz signals while the needle type meter has VU, Peak and Peak Hold settings. 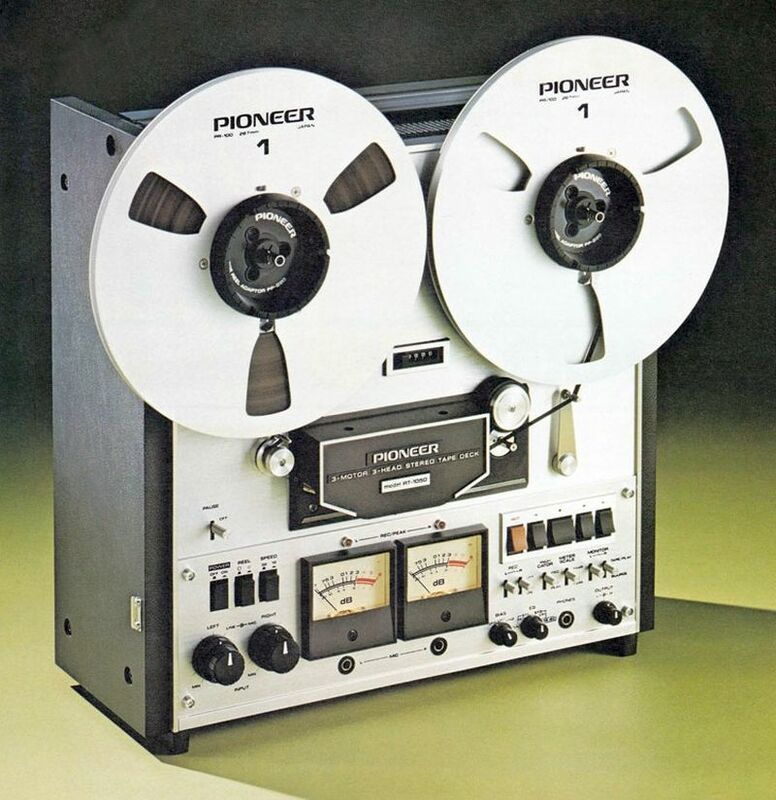 ​The tape recorder has 3 speeds: 38, 19 and 9.5 cm/s and pitch control with a +/-6 % range. The azimuth of the recording head can be adjusted with the help of the built in test tone. 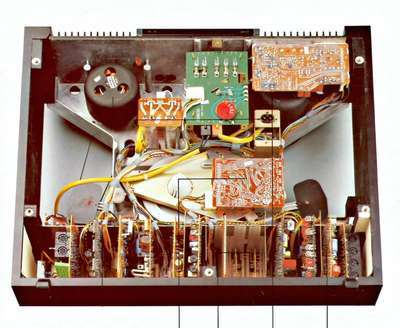 Frequency response is (+/-3dB) 20 - 37,000 Hz (38 cm/s) 20 - 29,000 Hz (19 cm/s) and 20 - 17,000 Hz (9.5 cm/s). 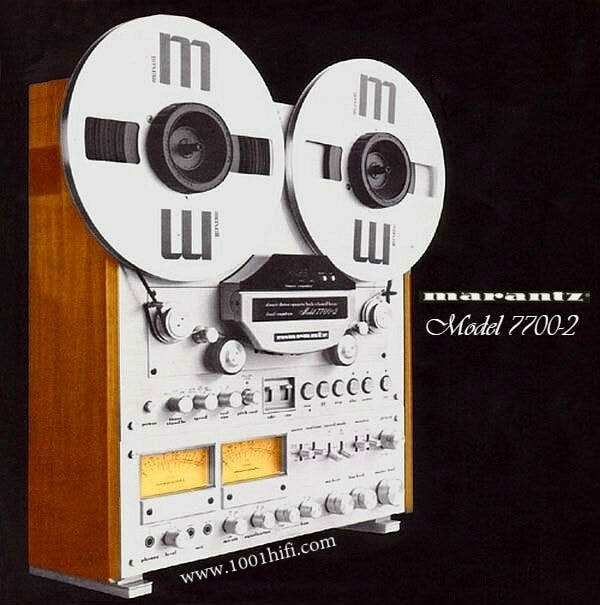 The initial price in 1979 of the marantz Model 7700-2 was 3200 DM in Germany and $2500 in the USA. ​The OLYMP 005 Stereo (Олимп-005-стерео) tape recorder was released in 1986 as the most advanced tape deck in the former USSR. Previous versions were the model 003 and 004 and it was followed by the model 006. 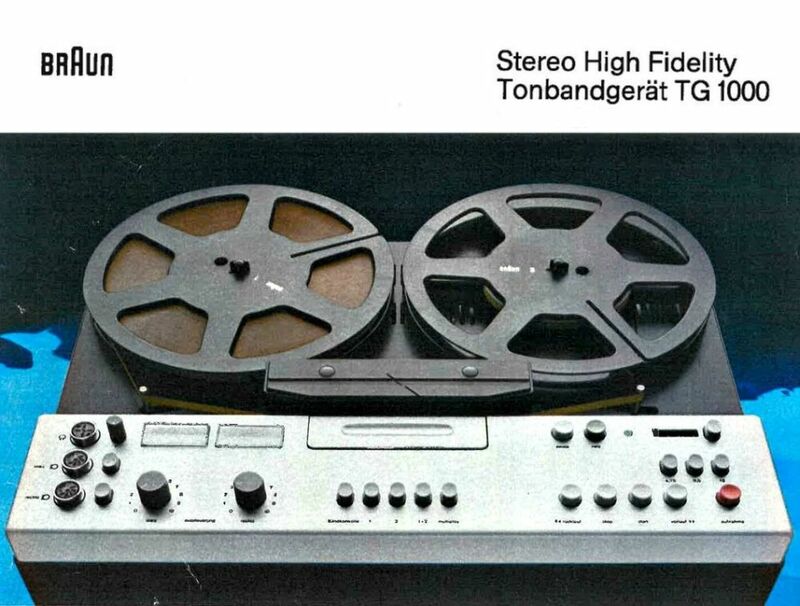 The model 010 pictured in the "family" advert aparently was never manufactured, it was planned to be released in 1991 as a two track recorder that could run at 38 cm/s speed. The OLYMP 005 Stereo is a full auto-reverse model with quartz speed control, 3 motor, 3 head configuration and bias adjust for recording. The tape recorder has a sophisticated tape program/search function, digital tape counter and fluorescent level meters. 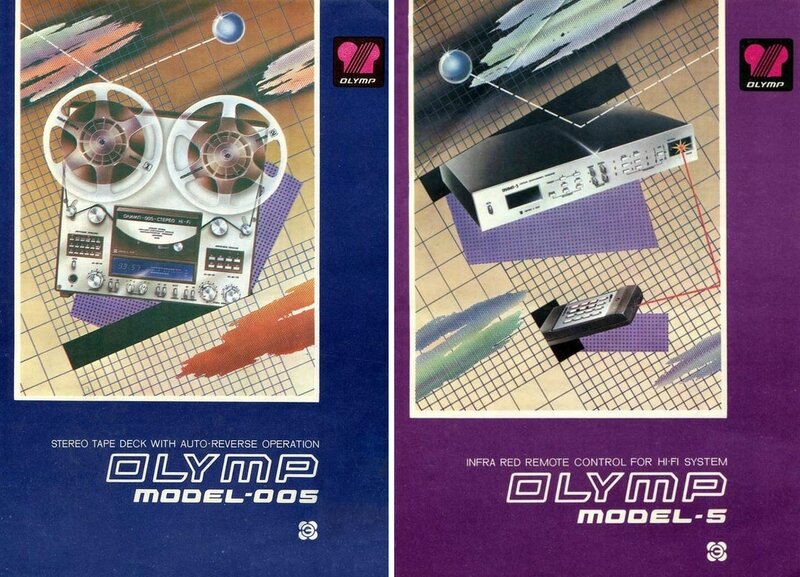 With the help of the additional OLYMP model 5 timer/remote unit the tape recorder can be operated by a hand held infrared remote controller and it also added preprogrammed timer play/recording function to the OLYMP 005 Stereo tape recorder. ​The recorder has a built in 20W/ch amplifier, clock/timer for programmed recording in a 24 hour interval, multiplay and echo recording and illuminated tape control keypad. 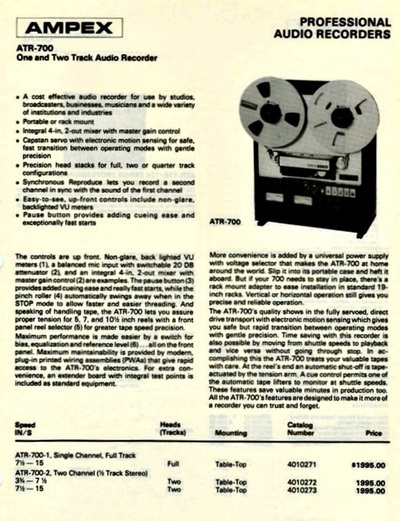 A four digit tape counter with counter adress search system enables quick program finding while the N6719 (sold as accesory) allows remote operation of the tape recorder. Technical data: Frequency response 40-20.000 Hz (19 cm/s) Dimensions 520 (W) x 500 (H) x 210 (D) mm Weight 22 kg. 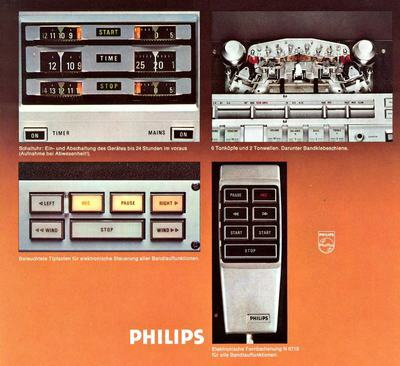 See more PHILIPS in our collection here. 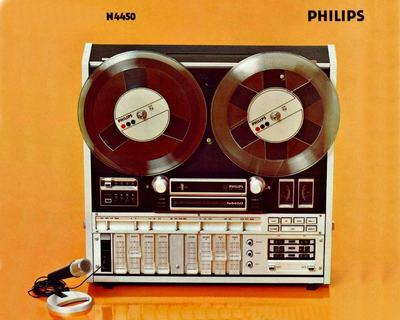 ​King of PHILIPS tape recorders, this is the PHILIPS N4520 reel to reel tape recorder introduced to the market at the end of 1978 begining of 1979. 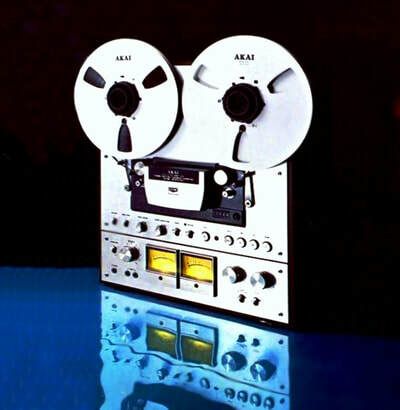 This high quality 3 motor 3 head tape recorder was available both as a 4 track recorder (N4520) and 2 track recorder (N4522) both featuring 38, 19 and 9.5 cm/s tape speeds. 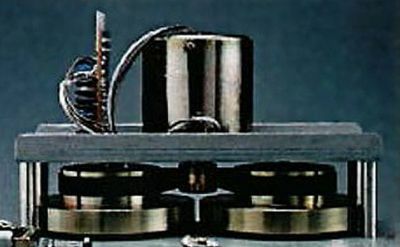 The reel drives were using direct drive motors while the capstan drive was using a belt drive PLL Quartz controlled motor. 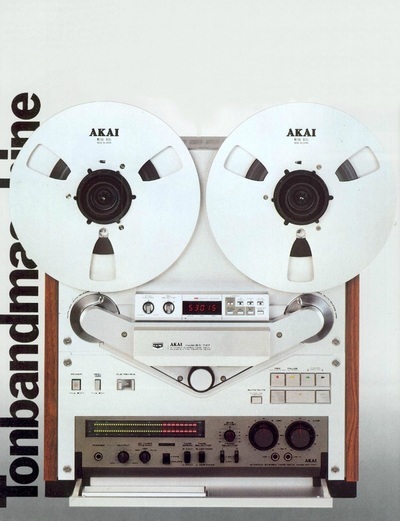 A high precision digital display was used to measure tape length in meter and decimeter. 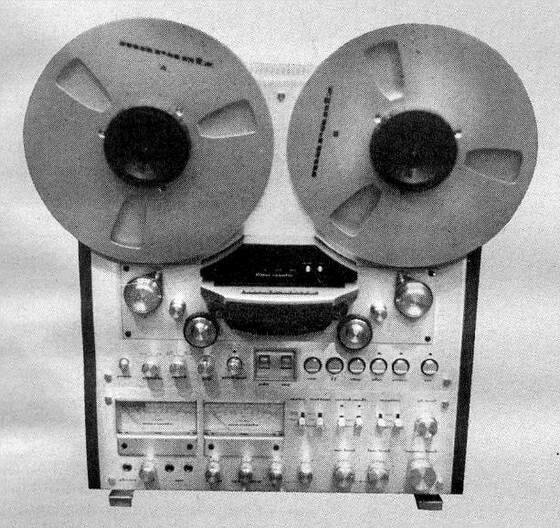 The use of FSX/Ferrite heads and a continuosly variable BIAS made possible to achive high quality recordings with speeds up to 38 cm/s. There is provision for separate microphone/DIN and line level input that can be mixed together while the sound on sound function could be used by home musicians to record their multi instrumental (vocal) recordings. 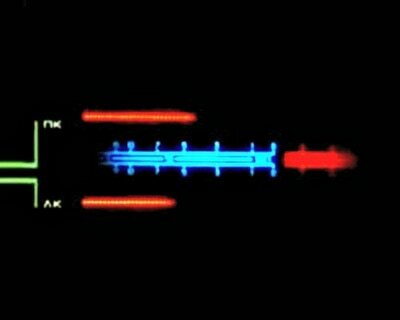 Accurate recording levels can be achieved with the use of two needle type selectable VU/Peak level meters with Peak LED level. 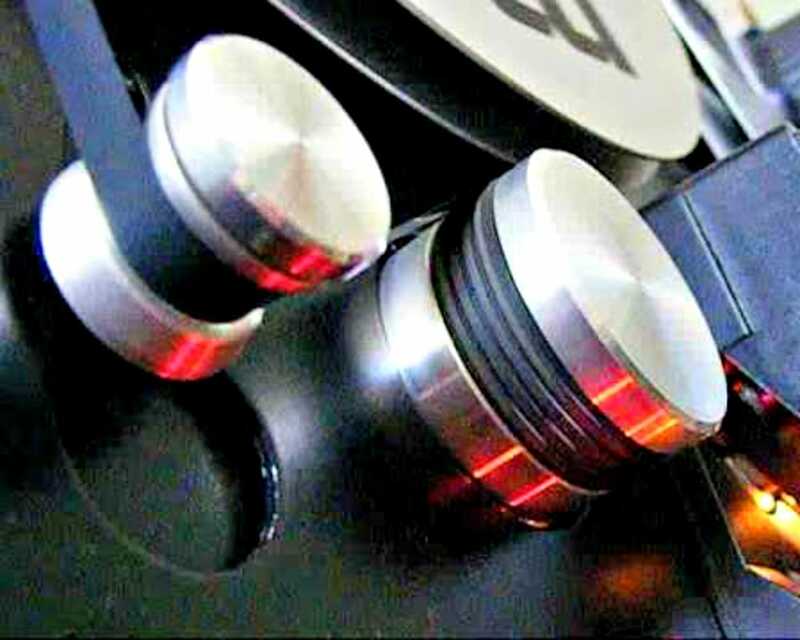 For fast winding there is a variable speed control while for headphone output there is a separate headphone amplifier. Technical data for N4520: Frequency response 30-26,000 Hz (38 cm/s) 30-20,000 Hz (19 cm/s) Signal to noise: 64 dB (38/19 cm/s) Dimensions: 530 W x 527 H x 230 D mm Weight: 25 kg. 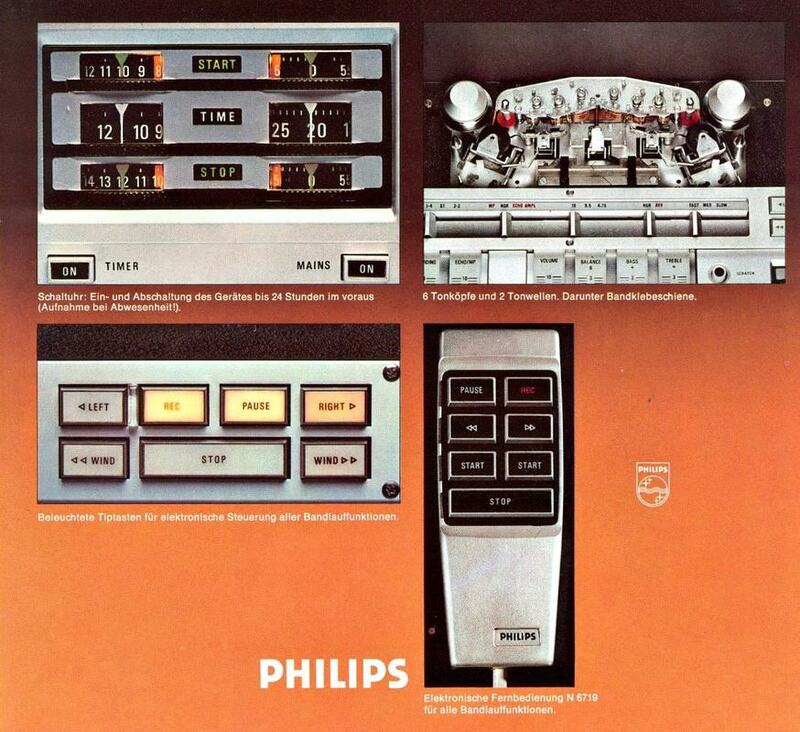 See more PHILIPS in our collection here. 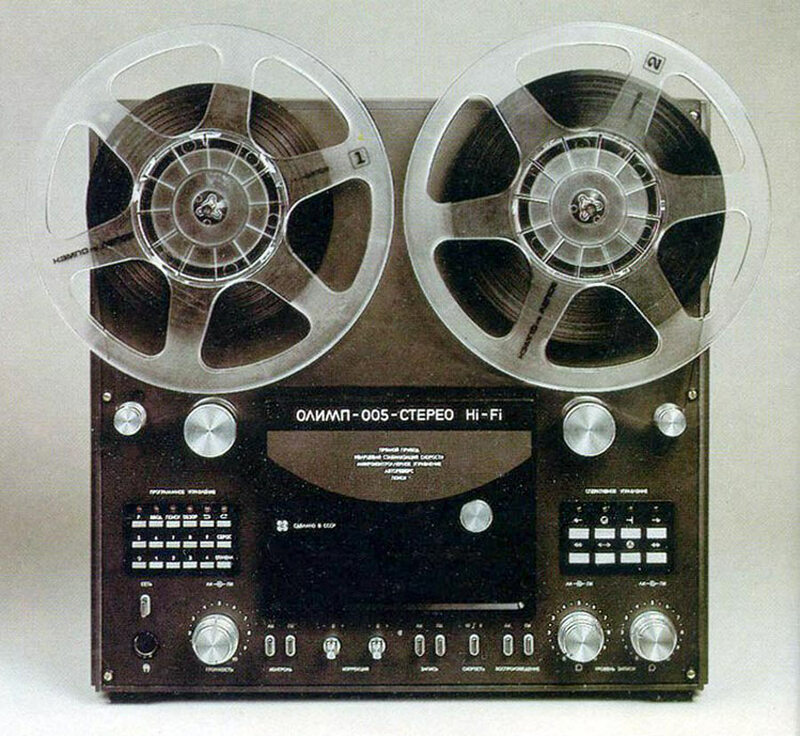 ​(PP-204T) for 4-track recording and playback. 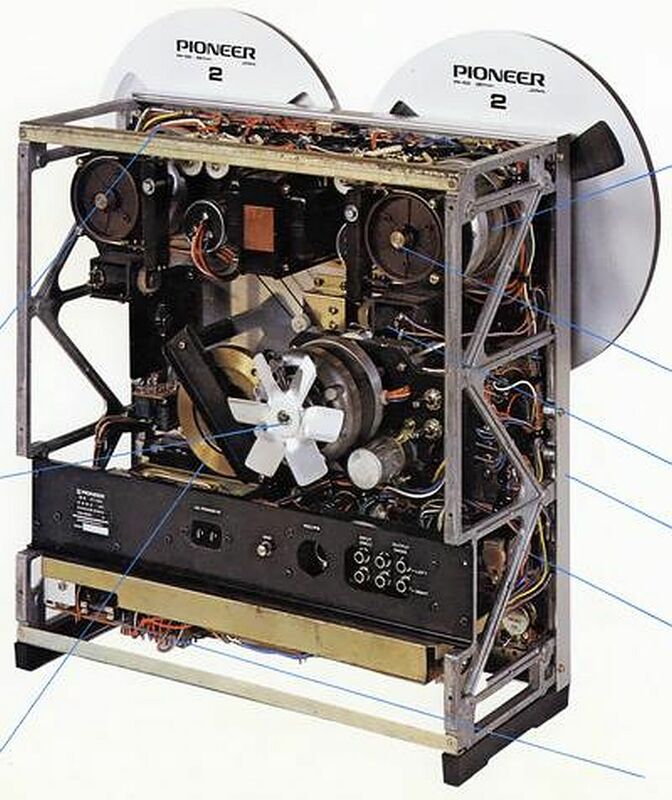 Also standard on the PIONEER RT-1050 is it's two-speed drive system with 19 cm/sec. and professional 38 cm/sec. 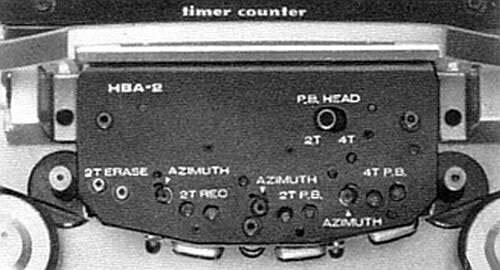 speeds selectable at the push of a button. 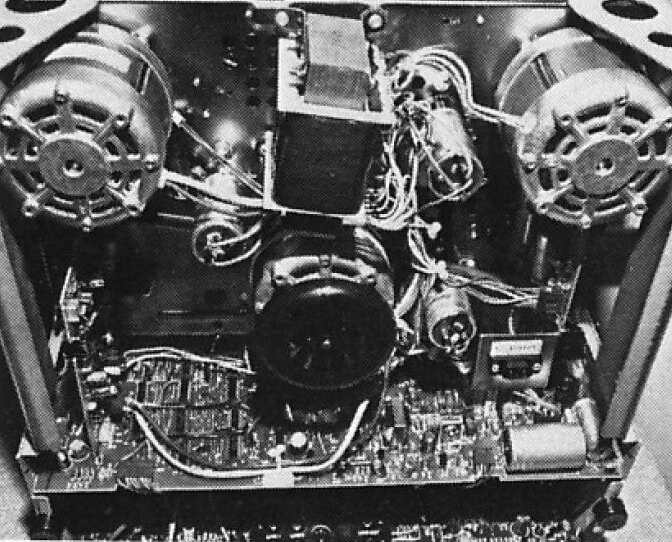 The higher, 38 cm/sec. 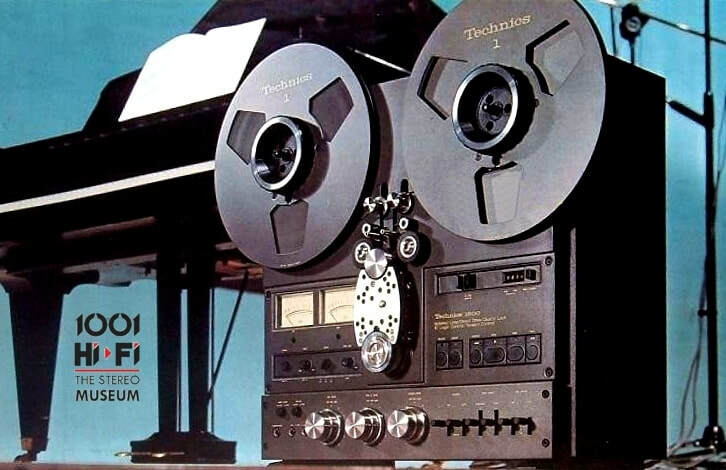 speed is a world-wide standard for half-track studio machines and provides the most ideal audio results possible with 1/4" tape. 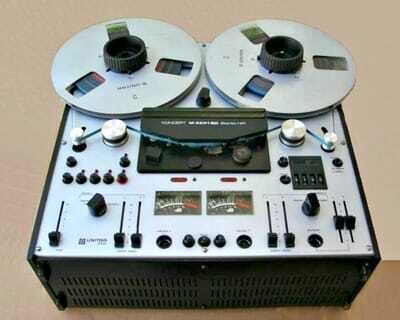 The deck's 3-motor tape transport system is beefed up to handle all reel sizes up to studio-use 27 cm type with ease. 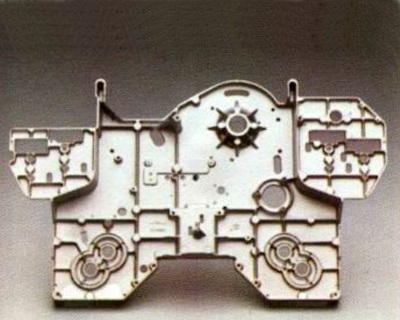 A 5mm - thick chassis and solid, die-cast framework provide additional strenght. 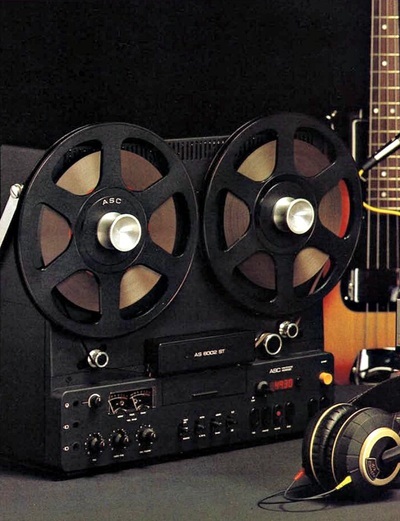 So that you can use any type of tape with minimum distortion and maximum performance, the RT-1050 is equipped with a three-step BIAS selector (STD, LH-1, LH-2) and a four-step EQ selector (NAB STD/LH and IEC STD/LH). 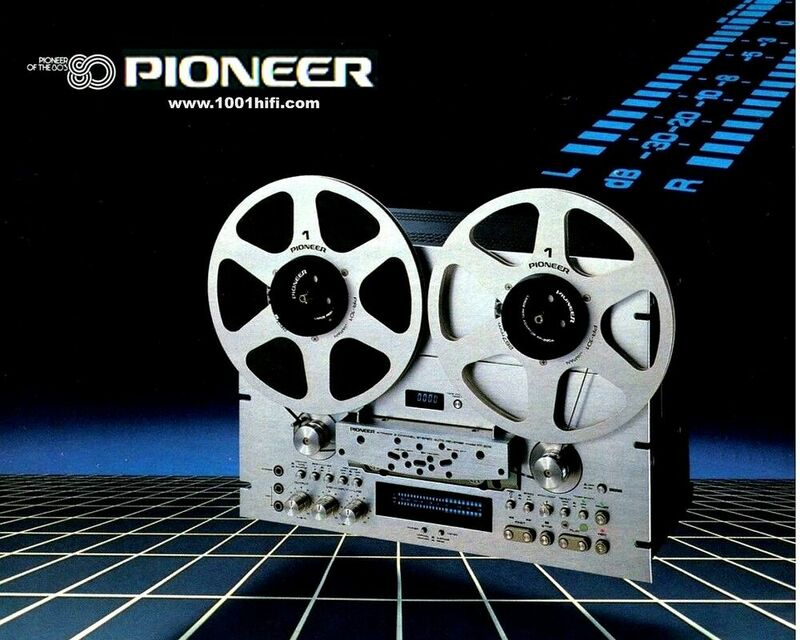 Dual-scale level meters, a recording peak indicator, lockable, feather-touch electronic controls and many other Pioneer luxury touches add control convenience and versatility to this unusual stereo tape deck. 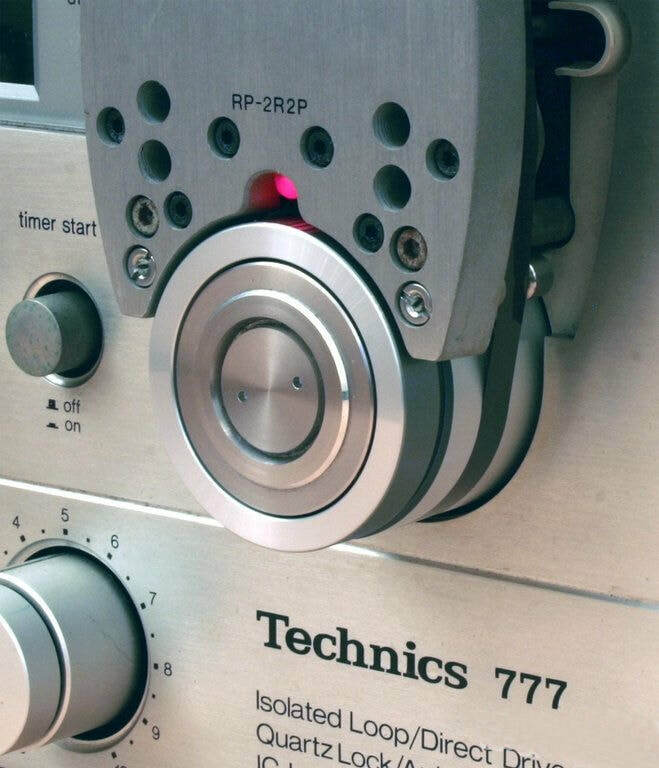 ​A true classic. 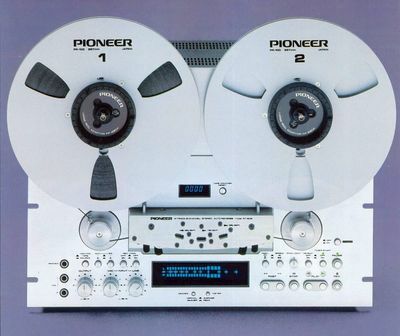 This is the PIONEER RT-909 reel to reel tape recorder introduced in 1978. 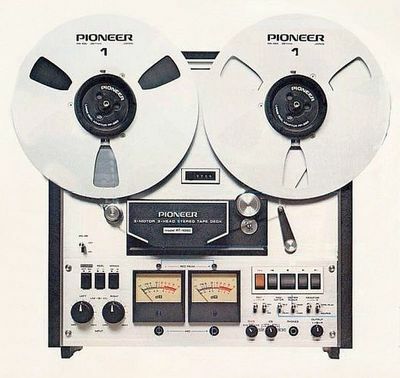 When PIONEER designed the RT-909 open-reel tape deck they made certain it had every conceivable feature an audiophile could expect. 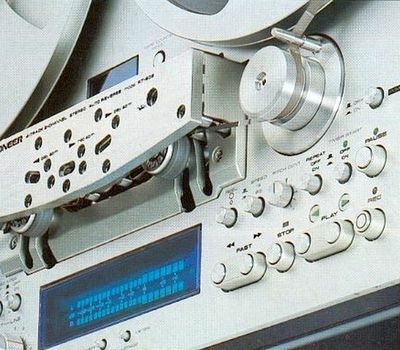 This tape recorder has a specially designed closed-loop dual capstan system that isolates the tape at the heads from any external interference. 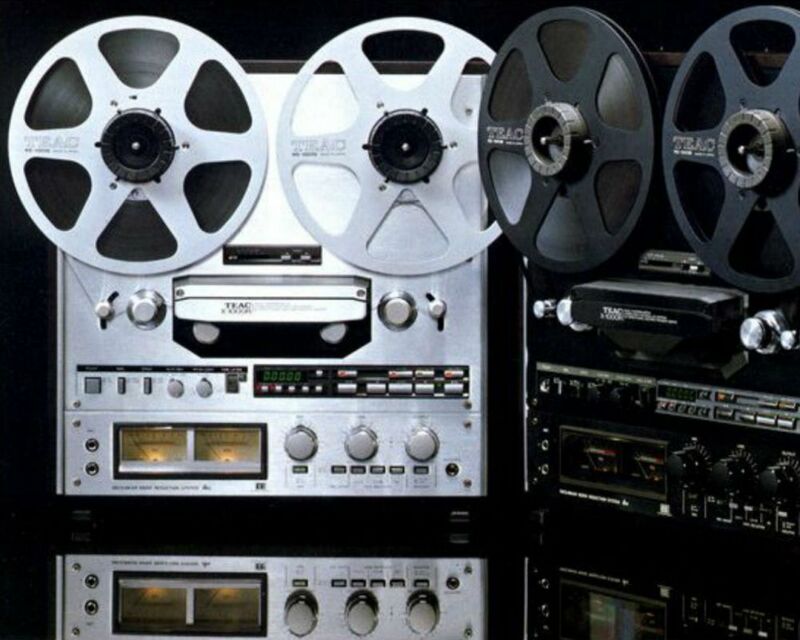 So you get constant tape-to-head contact and constant, clear, accurate sound. The main motor is an accurate DC motor that generates its own frequency to correct any variations in tape speed, and keeps wow and flutter down to an unheard of 0.04% at 19 cm/s. The RT-909 also has a logic control system that ensures smooth, accurate speed change while also offering automatic reverse, automatic repeat, and timer controllable mechanism that lets you reord a midnight concert even if you can't stay awake for it. 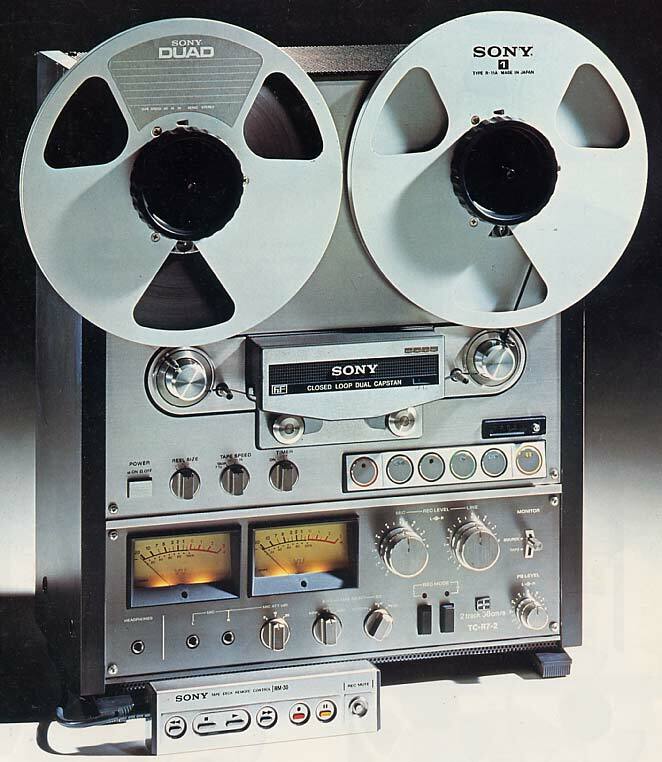 The playback heads, for example, have a new "contourless" design that makes them more sensitive. 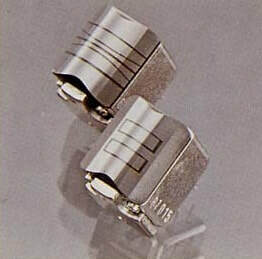 They increase frequency response upwards to 28,000 hertz and extend it all the way down to 20 hertz. The RT-909 also has a Furoscan metering system that gives you an instantaneous picture of what you're listening to. 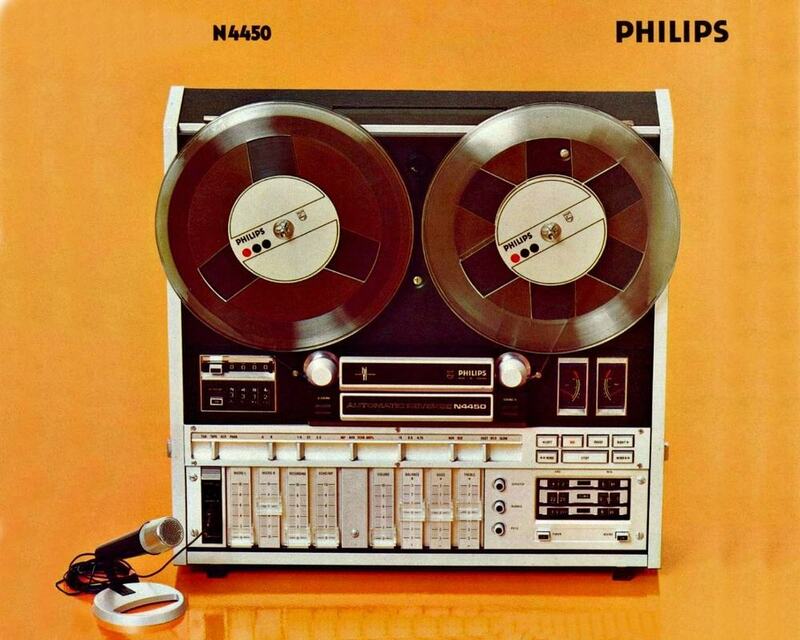 A pitch control that lets you listen to music in perfect pitch even if it was far from perfectly recorded. 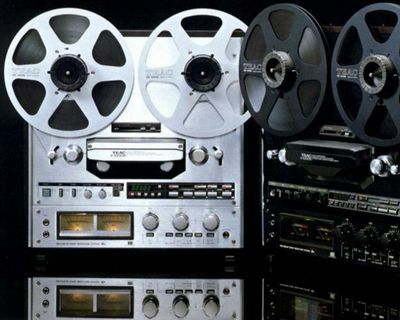 Four different bias/equalization selection will allow you to use many tapes brands / formulations and get maximum performance from them all. 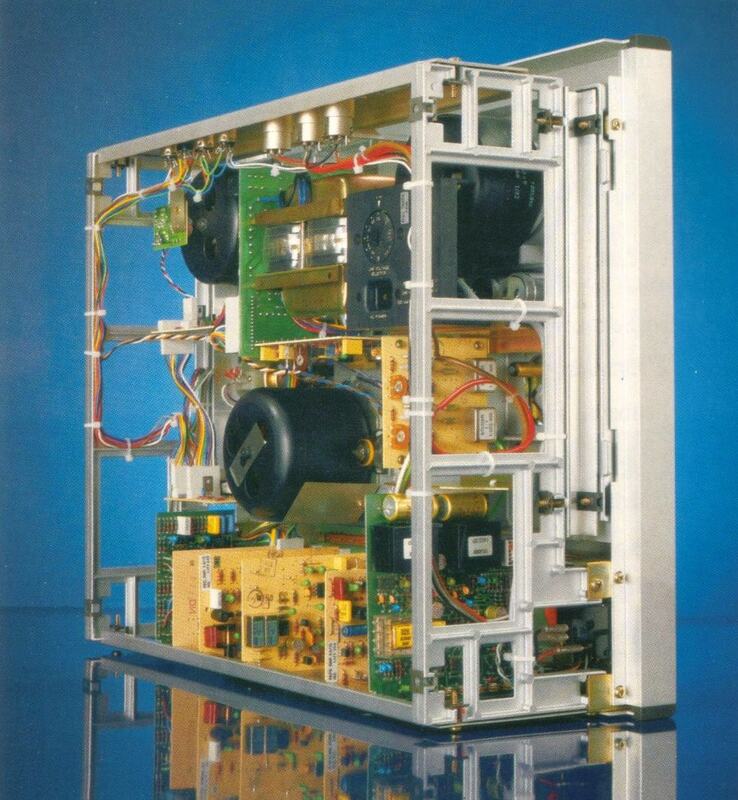 The cabinet is seized for rack mounting on the EIA 19" standards such as the PIONEER JA-R2S. 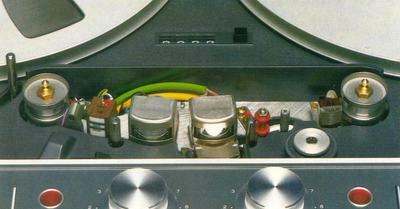 ​Audiophiles throughout the world know that the Revox name is synonymus with high fidelity components of uncompromised quality. 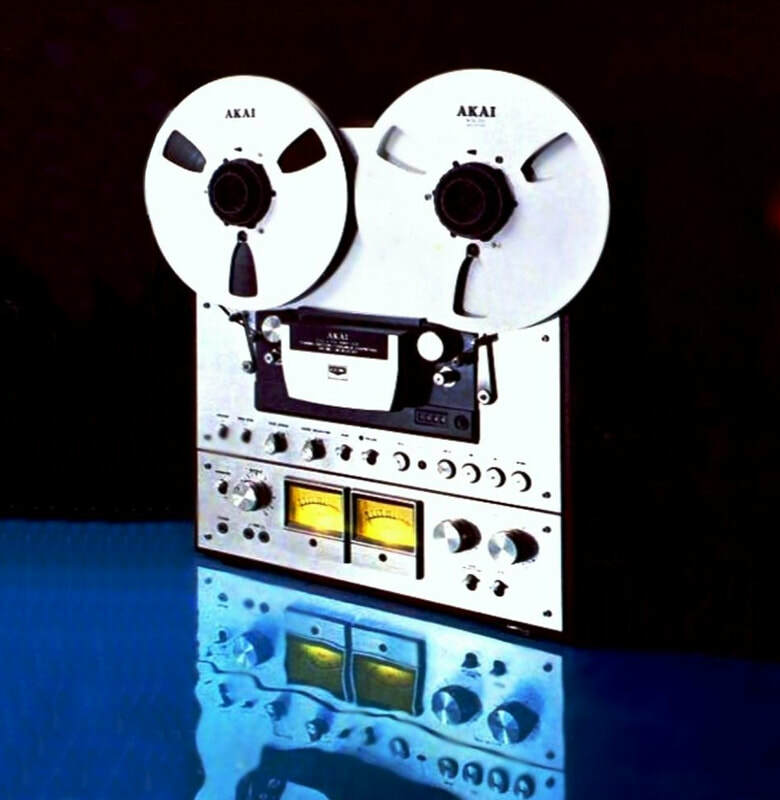 Succesor to the world-acclaimed A77 and heir to the proud tradition that has made Studer studio recorders the standard of the industry, the B77 is fully professional in performance, yet penultimately easy to load and use. Tape motion is constantly sensed automatically, and a protective circuit ensures that you will never snarl or snap a tape even if you go directly from fast-forward into play. 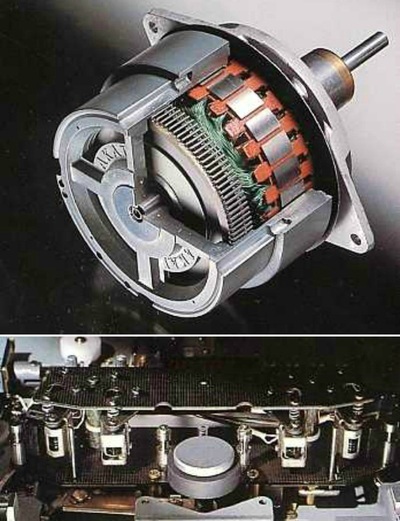 The two reel motors are triac-controlled, with a tension switch providing optimum torque for either large or small reels. The capstan is direct-driven through a servo-mechanism that ensures constant, accurate speed even in the presence of power-line fluctuations. 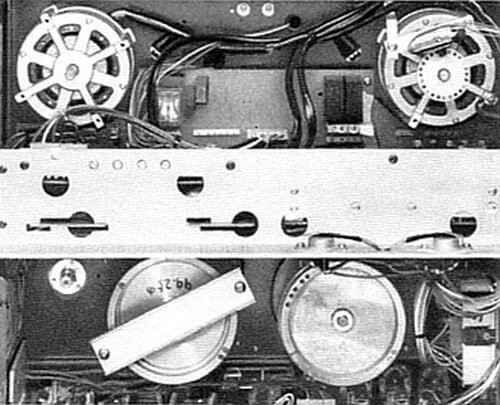 Standard speeds are 19 cm/s and 9.5 cm/s with a high speed 38 cm/s and 19 cm/s model available. 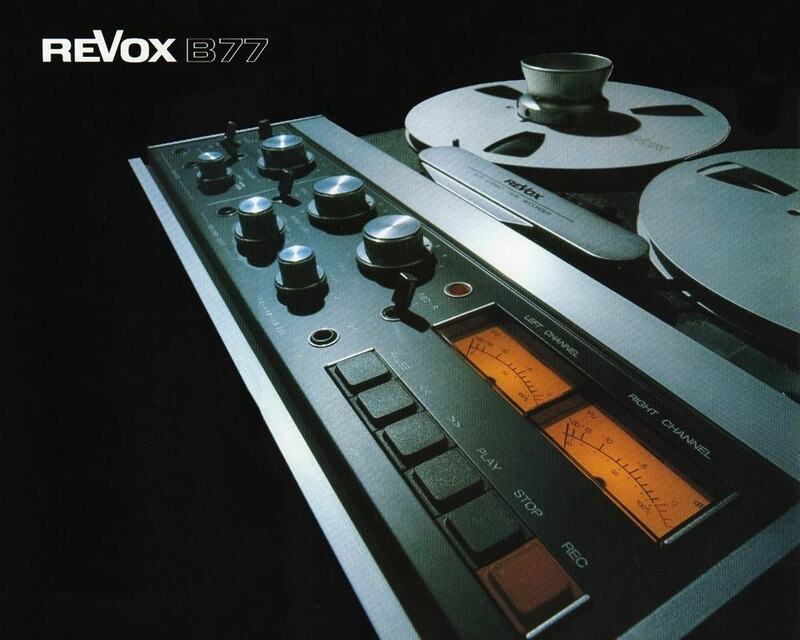 To achieve long term stability the Revox B77 uses a sturdy aluminium die-cast for the chassis, headblock, pinch roller, and mechanism. 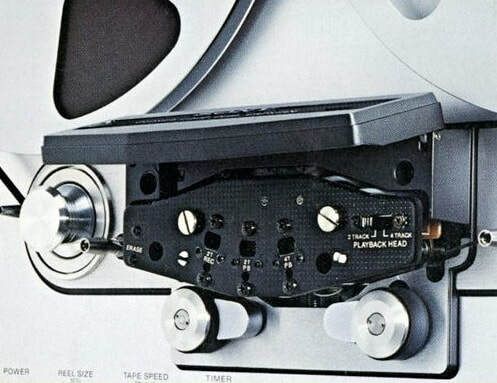 Studer tape heads are world-renowned with head cores made from a physically hard, magnetically soft metal alloy called Revodur. 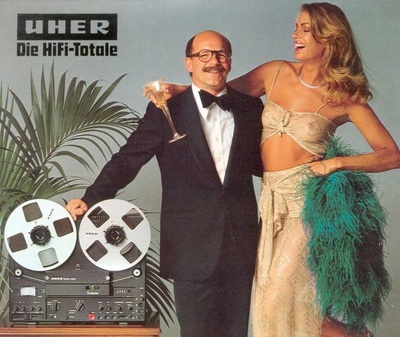 ​Frequency response (at -20 VU) at 19 cm/s 30 Hz - 20 kHz +2/-3 dB. Dimensions 452x414x207 mm Weight 17 kg. 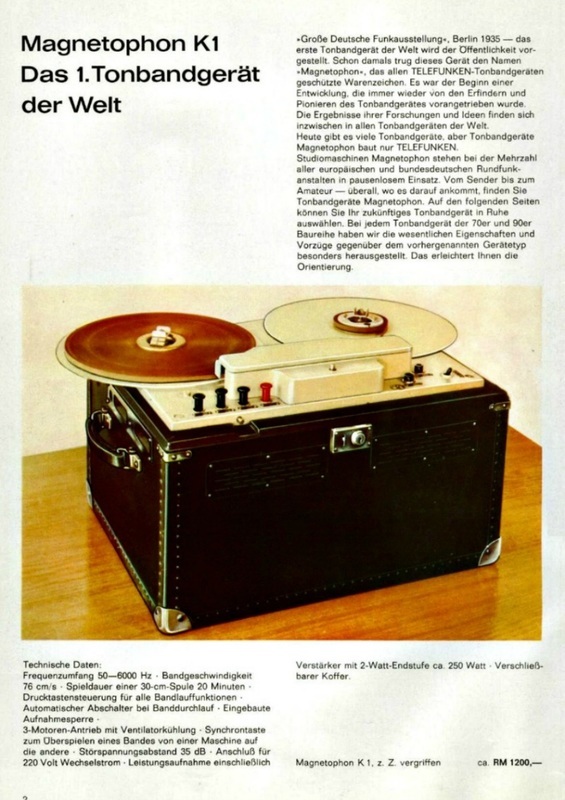 ​Finally a book fully dedicated to all the wonderful tape reel to reel recorders of the Swiss brand. 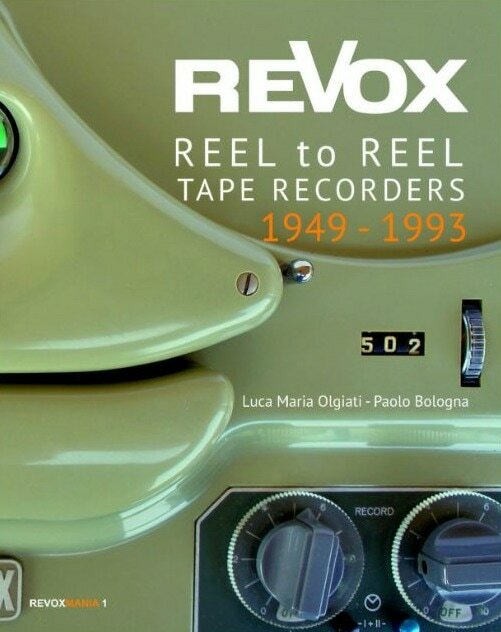 More than 30 years after production of the last ReVox reel to reel machine, we are proud to introduce now the first book of the complete reel to reel production range: 240 pages and 400 color photos, with rich text in English and Italian. Made for the 50th anniversary of the A77's birth, the most famous reel to reel recorder ReVox (shown even on Pink Floyd's Ummagumma cover), the book 'REVOX REEL TO REEL TAPE RECORDERS 1949-1993' presents in detail all 25 legendary issued models with full history, versions, technical and curiosity in 240 pages and over 400 unpublished Hi-Res photographs. Available on-demand printing from Blurb. The work was carried out by two expert technicians collectors of the swiss company, based on one of the most complete existing collections, and interviewing in deep ReVox and Studer designers, engineers, commercial managers of that time, with extensive research in Switzerland, Italy and Germany of all known versions and variants. 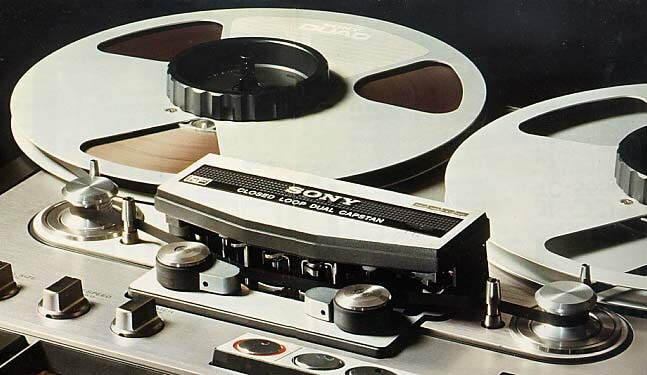 ​Sony's hi-fi components line has to be heard to be believed. 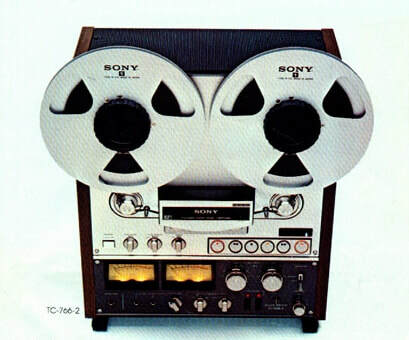 With the lowest wow and flutter of any deck Sony ever built, a duo of tape recorders were introduced in 1977. 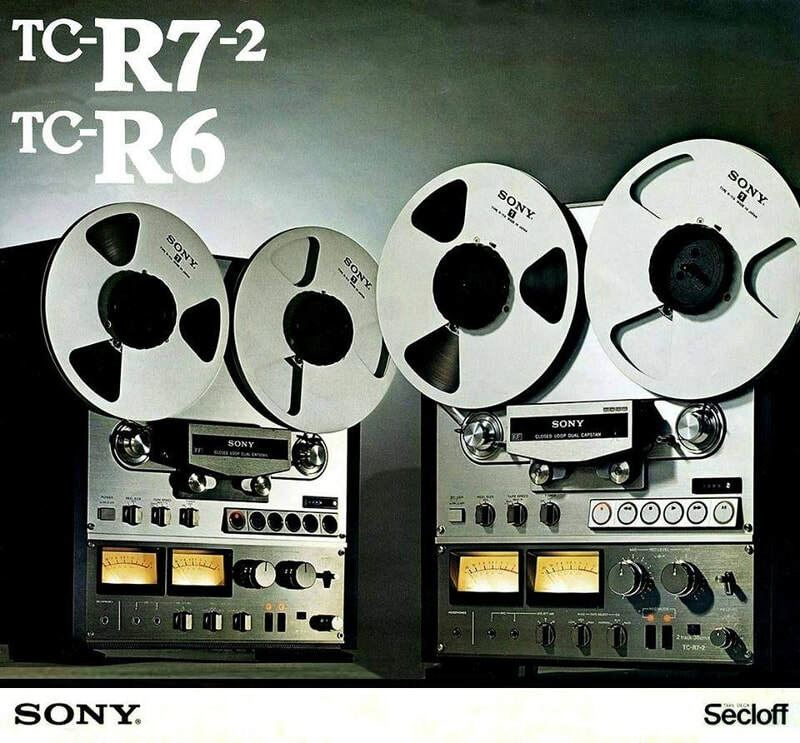 These were the Japanese market SONY TC-R6 and SONY TC-R7-2. 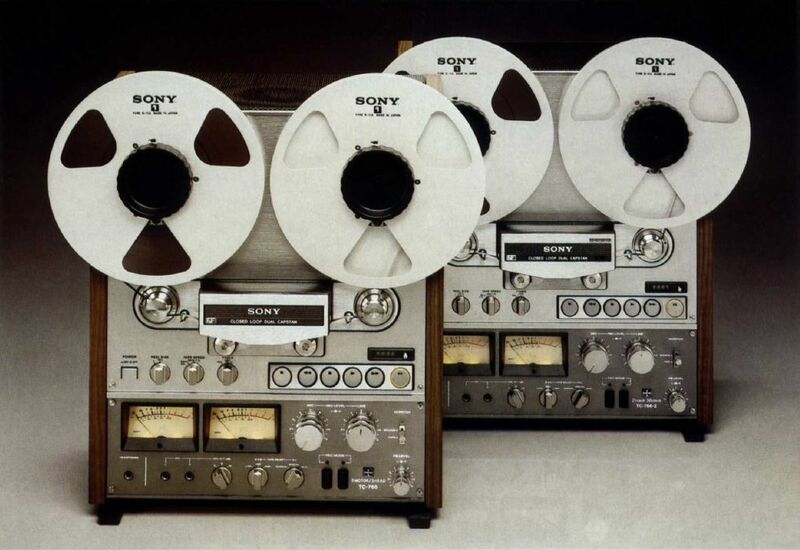 The same models were available worldwide as SONY TC-765 and SONY TC-766-2. 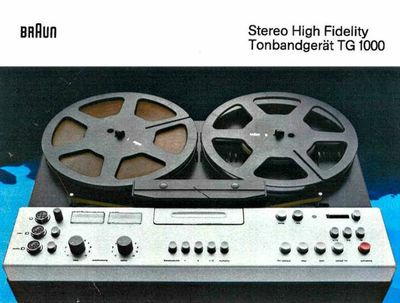 They both share the same construction but while the R6 is a 4 Track Stereo Recorder running at 9.5 and 19 cm/s the R7-2 is a 2 Track Stereo Recorder running at 19 and 38 cm/s with an additional 4 Track head for playback. 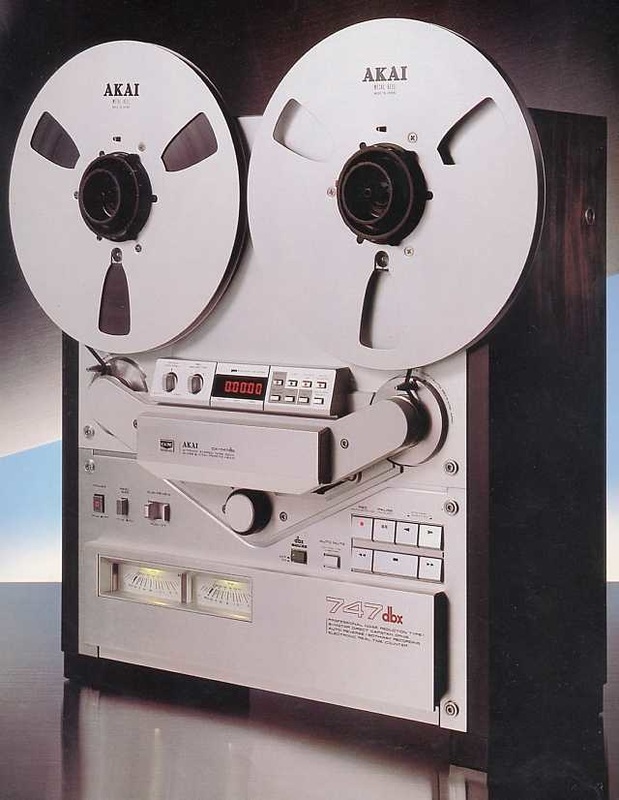 The SONY TC-R7-2 achieves an incredible wow and flutter of 0.018% (WRMS) at 38 cm/s and 0.04% (WRMS) at 19 cm/s. 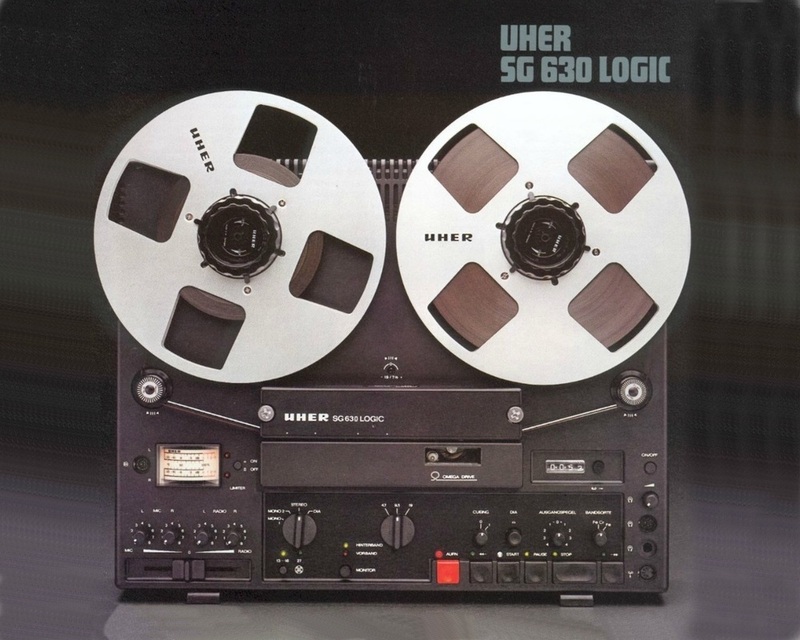 This is achieved via a Closed Loop Dual Capstan Tape Drive System. 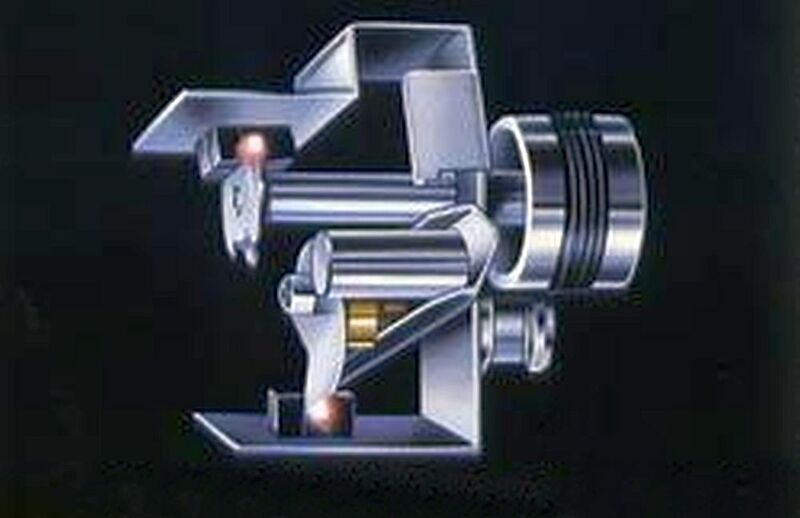 One capstan extends from the motor shaft itself, eliminating intervening gears that can hamper speed accuracy. 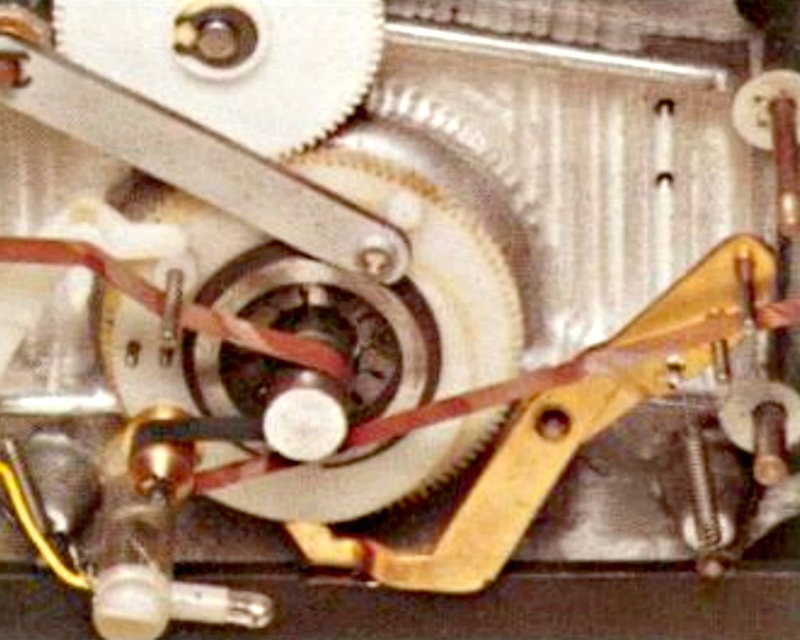 The other tape drive capstan connects through an extremely steady belt-drive inertia wheel. For a "mirror image" of the original signal, Sony's exclusive Phase Compensator Circuit comes closest achieving this by rectifying phase distortion and producing sound qualitty virtually identical to the original source. 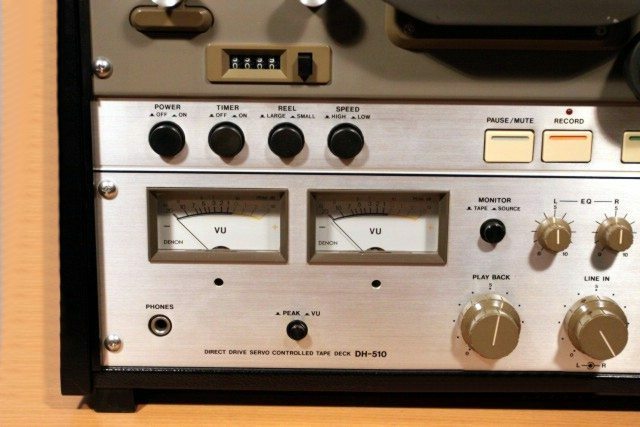 ​Illuminated, calibrated and ultra-clear for best monitoring possible, Sony's Professional Studio Standard VU meters are identical in size, shape, color and sensitivity to those on professional consoles. 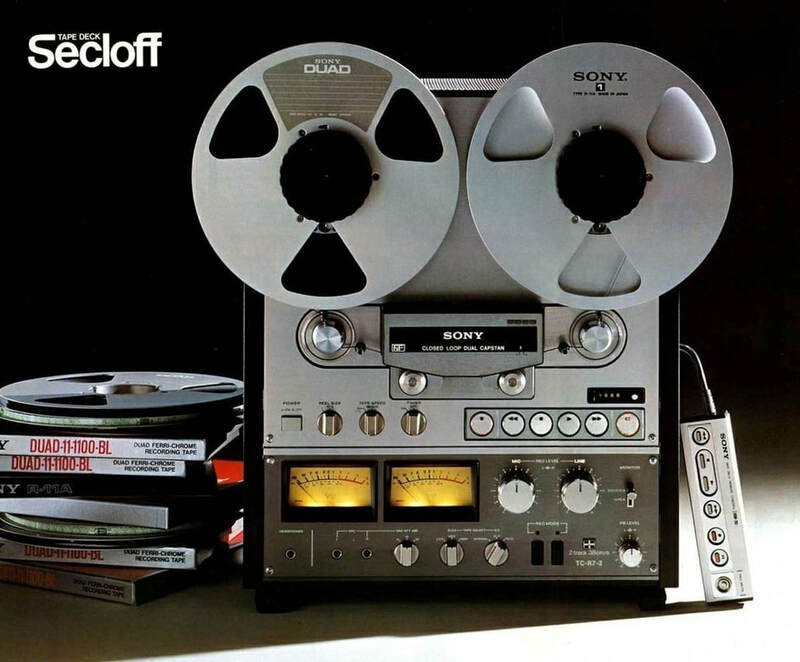 Because of Sony's outstanding Ferrite & Ferrite Heads, plus the remarkably precise fabrication and alignment of the head gap, recordings retain exact positioning of signal throughout the stereo field. 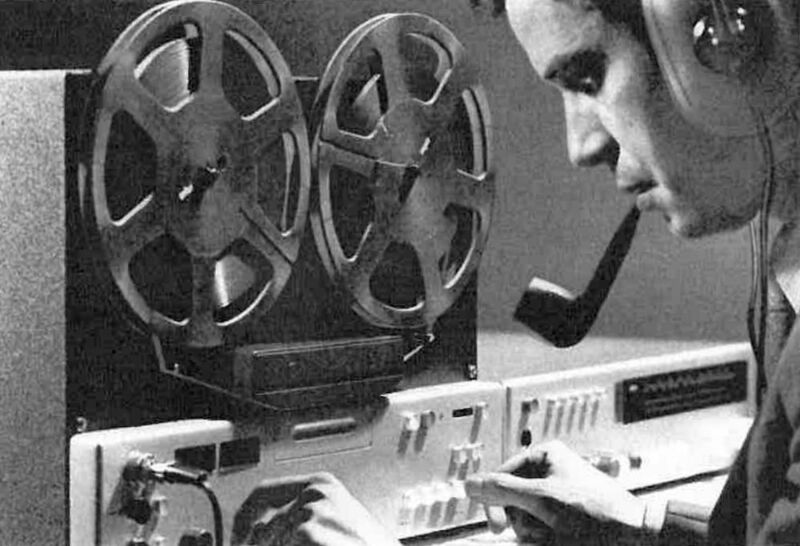 The "location" of individual sounds won't wander. 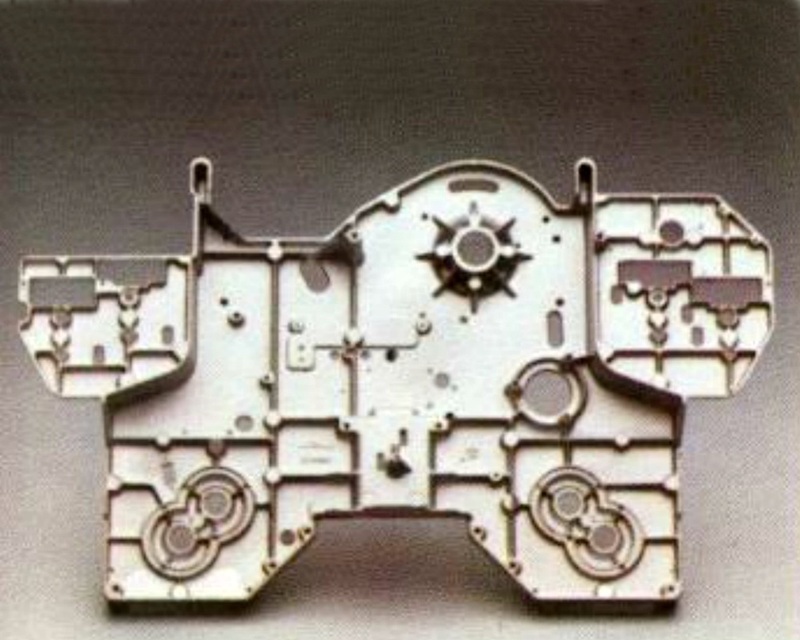 There's no annoying phase shift. 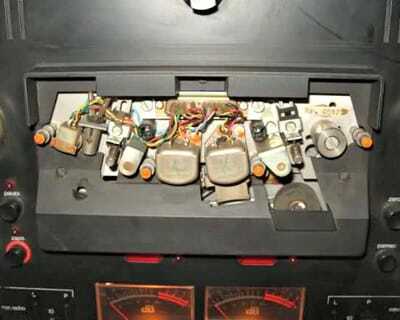 More professional features include direct-coupled playback FET amplifier, flashing Standby Signal, Punch-in Record and solenoid-operated Logic-Controlled Transport Functions to let you move instantly to and from any mode without stopping. 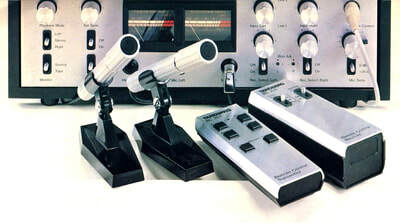 Standard equipment: RM-30 full-function remote control unit with record mute and hinged head cover. 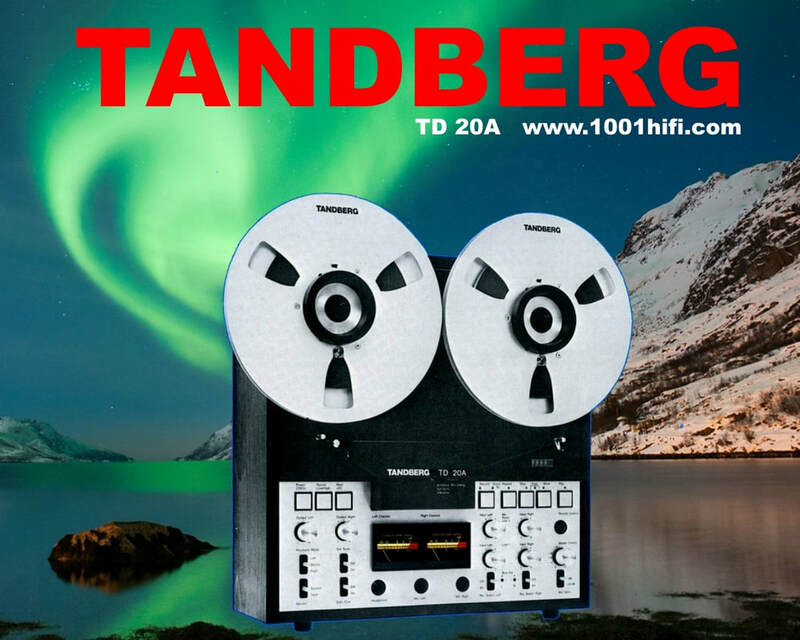 ​The TD 20 A was Tandberg's first open-reel recorder to incorporate the ACTILINEAR process. ACTILINEAR recording include a dramatic increase (20 dB) in the signal handling capacity of the record electronics making them essentially immune to slew-rate limiting and transient intermodulation distortion (TIM). 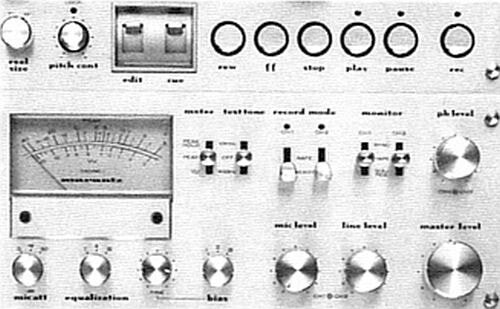 This means better transient response and lower distortion level. 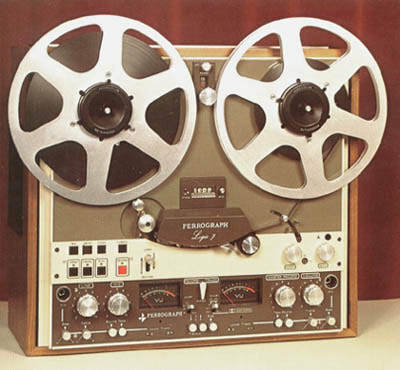 Front-panel bias adjustment controls have been included to facilitate optimum performance with any known or prospective tape. Four separate record-level controls, plus a master record control, permit full mic/line and line/line mixing, and a switchable 25 dB mirophone attenuator is provided to prevent possible overload when using high output speciality microphones. 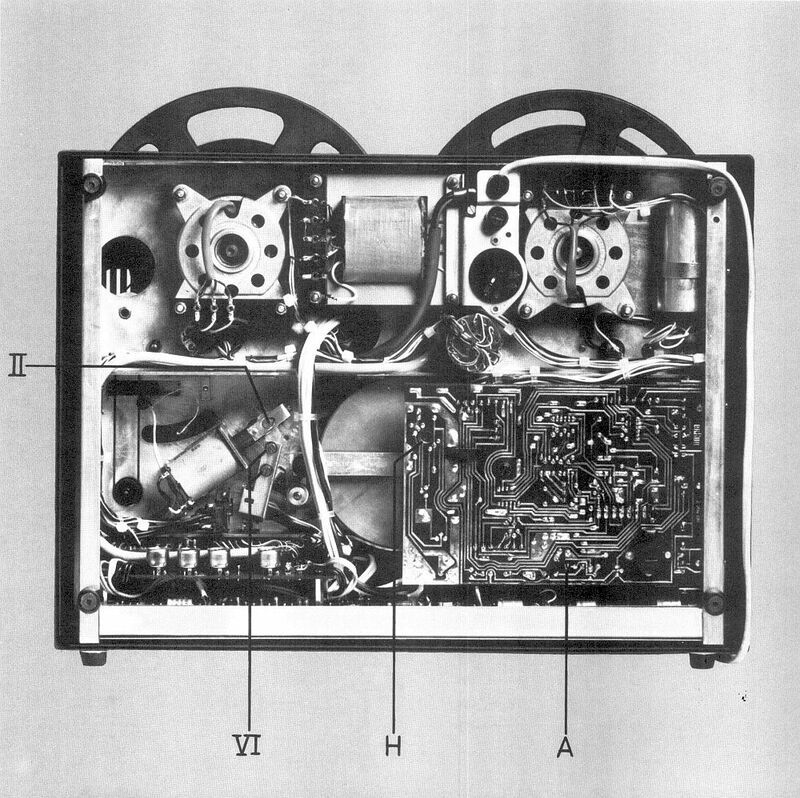 The TD 20 A transport contains four motors rather than three. 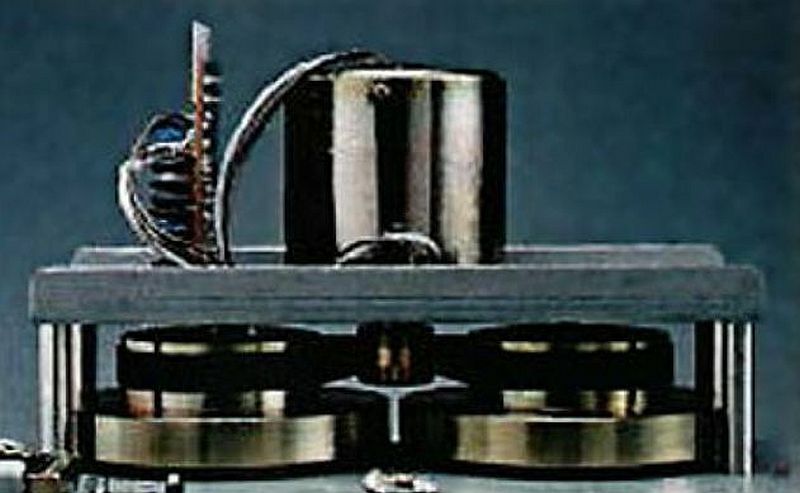 The capstan is driven by a brushless synchronous motor, and uses a belt drive and heavy flywheel to eliminate vibrations from being transferred from the motor to the capstan. 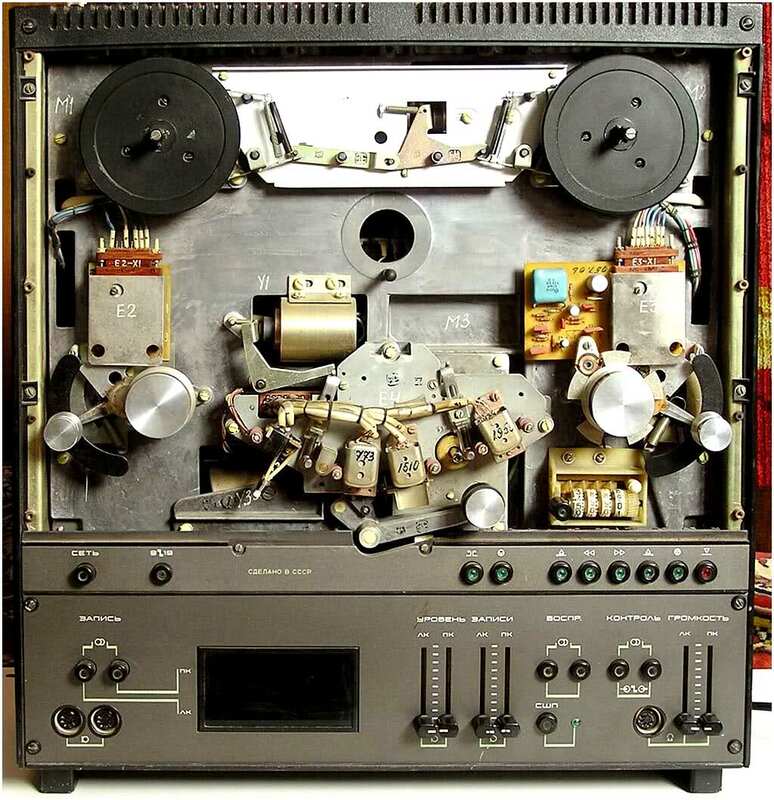 ​The two reel motors are directly coupled to the reel turntables, and are controlled by a "PROM" (program read only memory) with a trial output to provide constant tape tension. 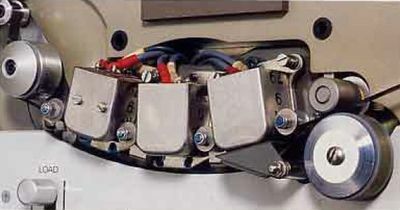 The fourth motor is used to operate the pinch roller and tape gate, achieving smooth, noisless control impossible with the conventional solenoid activated system. 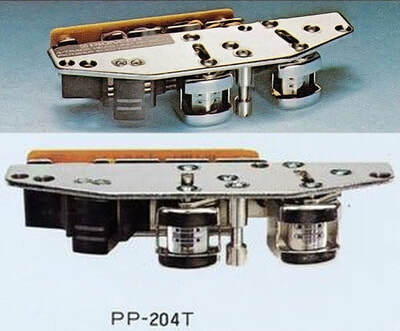 A 5 mm thick aluminium baseplate rolled under 40 tons of pressure in a unique "honeycomb" design eliminates stress and greatly increases strenght. 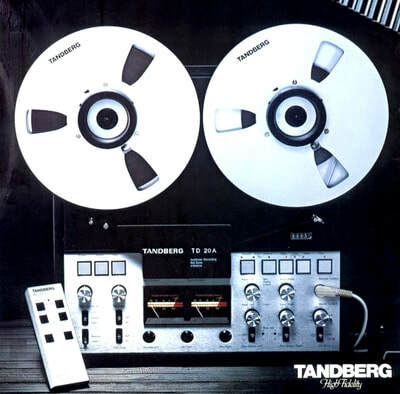 Tandberg's full -logic button control permits you to go from rewind into playback with complete safety, and allows the inclusion of "step-stop" editing with full monitoring capability. An optional infra-red remote control is also available. 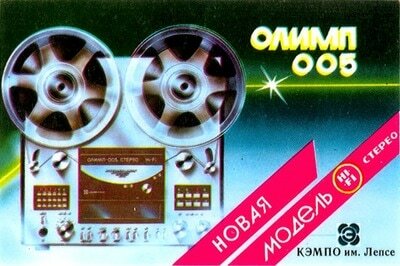 It was sold in two versions: 4 tracks and 2 tracks. 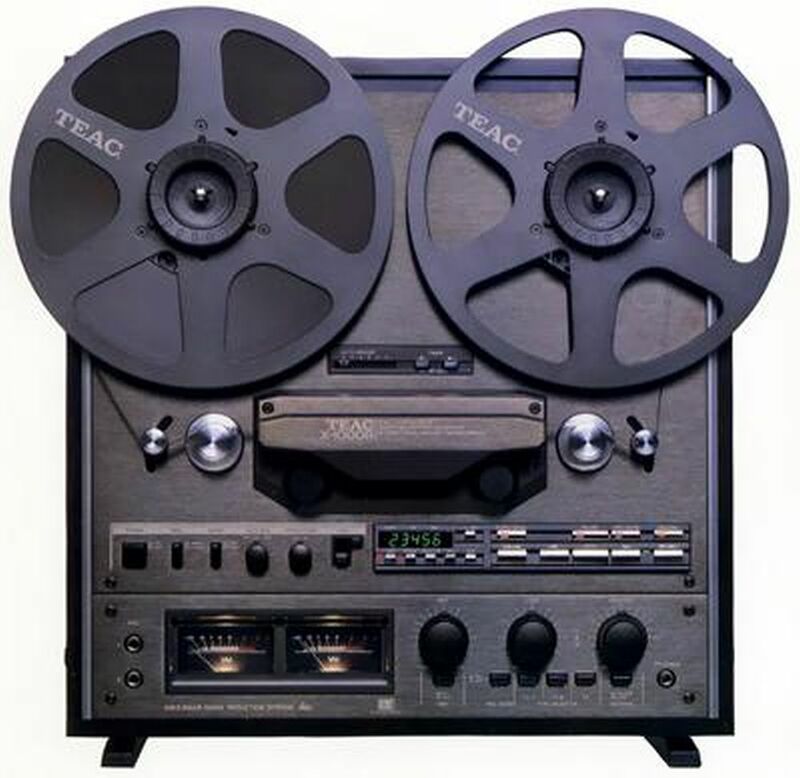 ​The TEAC X-1000R is one of those rare achievements in audio engineering that is just as much at home in a professional recording studio as it is in your living room. 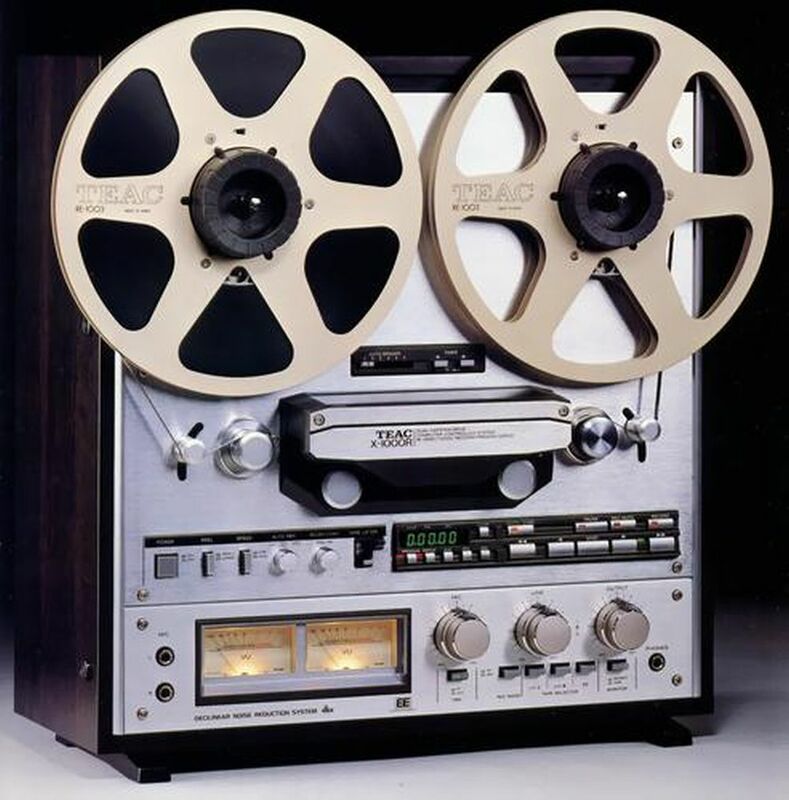 Above and beyond incredible music reproduction accuracy and the unparalleled convenience of fully bi-directional recording and playback, the X-1000R offers an extensive array of unique TEAC features that are unqestionably destined to becoma standard in open reel reproduction. 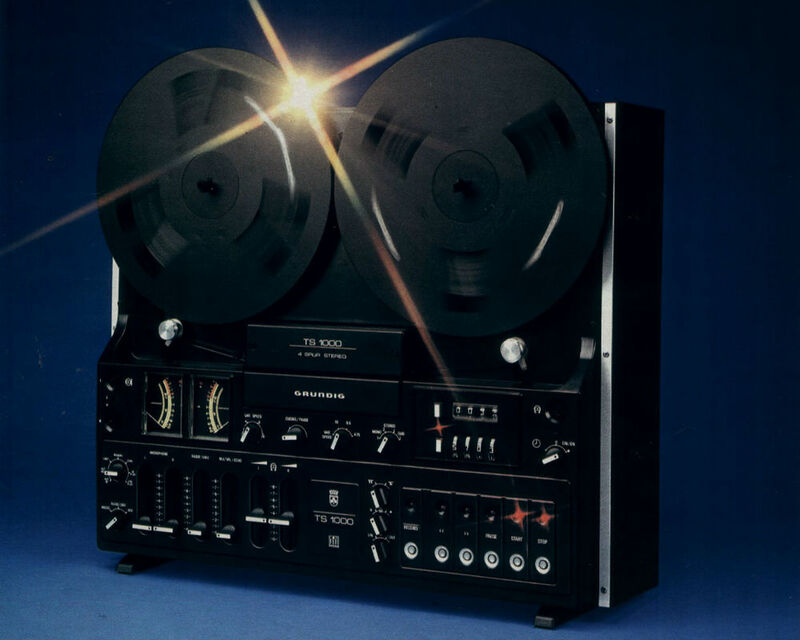 For example, there's a remarkably stable dual-capstan closed-loop tape transport with a newly developed micro-computer-controlled tension servo system that ensures superb tape handling precision. A built in dbx dynamic range expansion system lets you make recordings with stunning dynamic range and no audible tape hiss. 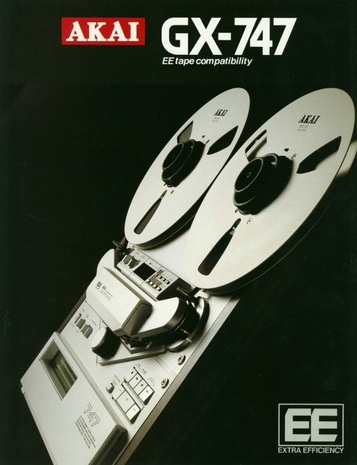 Compatibility with EE (Extra Efficiency) tape means you can record with the very finest tape available. A comprehensive locator system, originally designed for TASCAM (TEAC Professional Division) recording studio equipment, automatically searches for and locates any desired point on the tape. 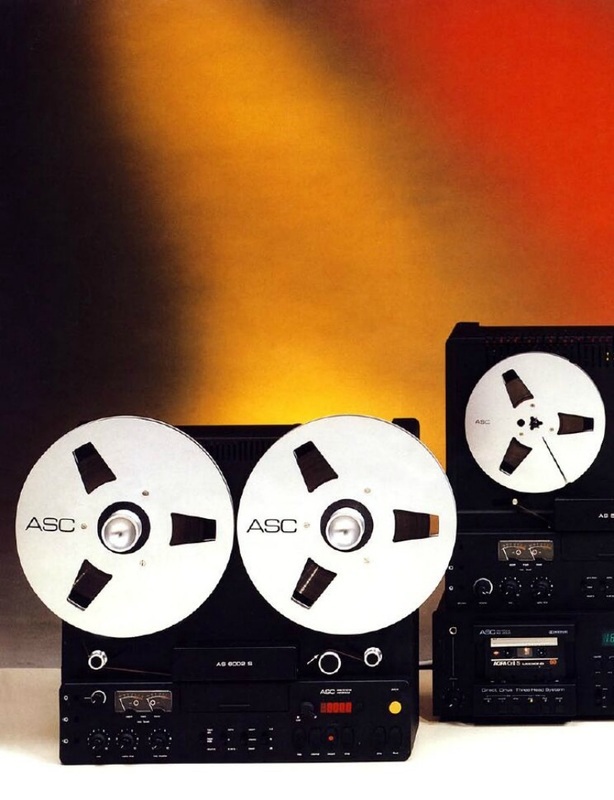 A block repeat function gives you the ultimate in repeat function versatility, and unique Dupli-Sync function offers automatic record synchronization when dubbing to cassettes....the list goes on. As a stereo music source, the X-1000R is the finest component you can add to your system. 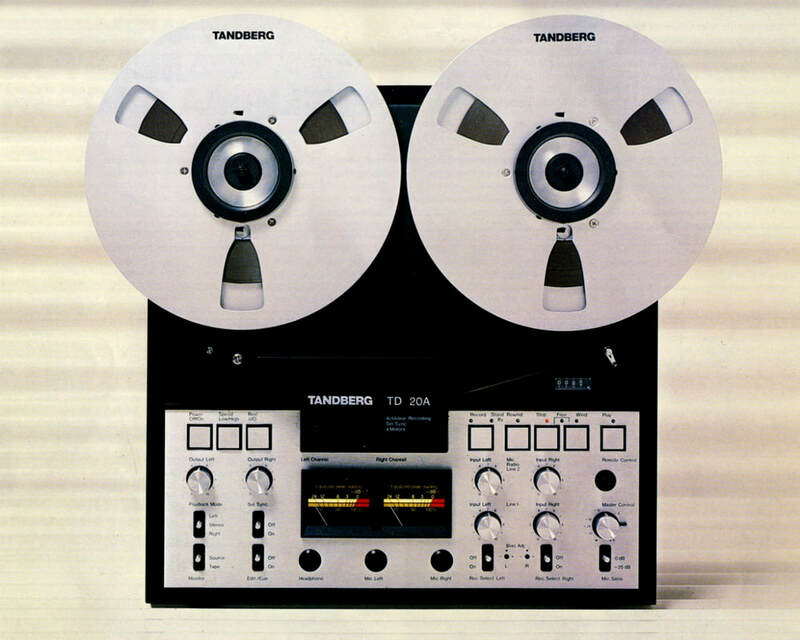 The TEAC X-1000R is a four track, two channel tape recorder with fully bi-directional recording and playback (6 heads) using a 3 DC motor transport with computer controlled dual capstan transport. 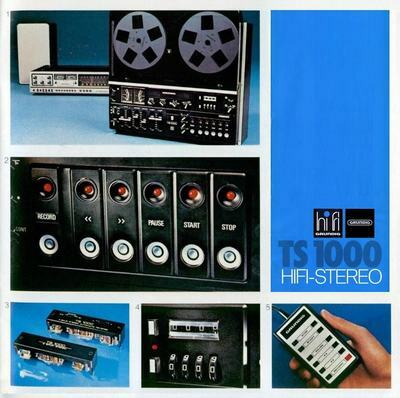 The TEAC X-1000R was available in silver (with optional wood case) and as X-1000RBL in black with wood case. 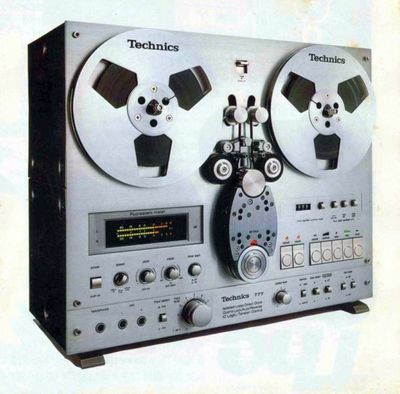 ​Technical data: Reels up to 26 cm - wow and flutter 0.03% (19 cm/s) 0.04% (9.5 cm/s) - Frequency response 30 Hz to 34 kHz (19 cm/s) 30 Hz to 24 kHz (9.5 cm/s) - overall signal to noise 65 dB (dbx off) 100 dB (dbx on) - dimenions (without wood panel) 432 (H) x 452 (H) x 262 (D) mm - weight 22 kg. 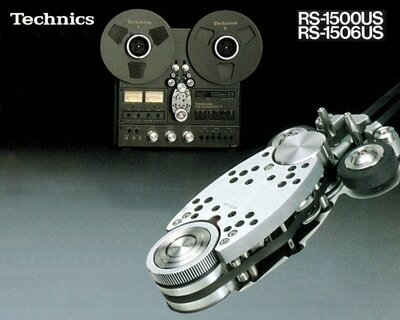 ​Both performance and operational advantages of the "Isolated Loop" tape path introduced in the Technics RS-1500US and RS-1506US qualify these professional units not only state-of-the-art, but as the begining of a new technological generation. 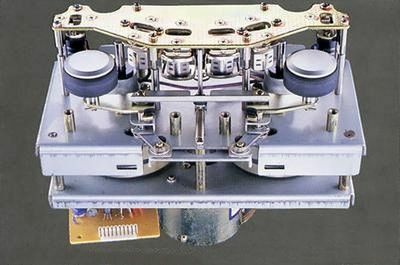 To realize the full potential possible with this design, there was no choice but to employ an all direct-drive tape transport system, with quartz-controlled, phase-locked servo control. 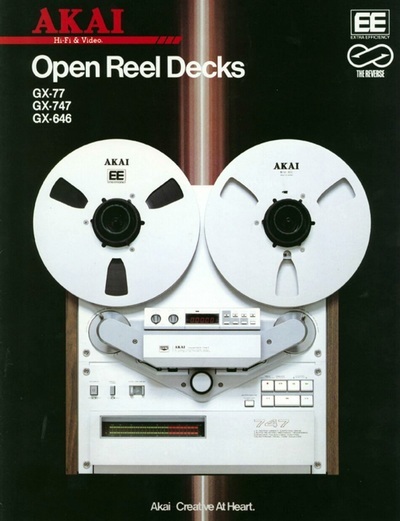 Electronically as well, these units were built as an uncompromising challenge to tape decks now available. 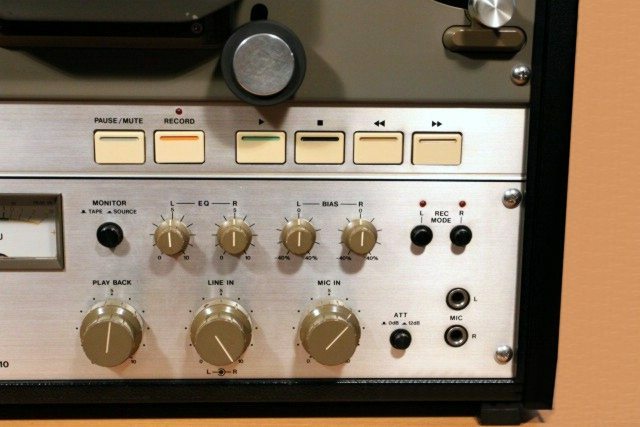 Separate microphone amplifier, recording amplifier, mixing amplifier and three-way bias and equalization controls all serve to help assure flawless recording and playback under any circumstances. Unique in tape recorder technology, the capstan of the RS-1500US is 34 mm in diameter, for increased tape contact and less possibility of slippage. 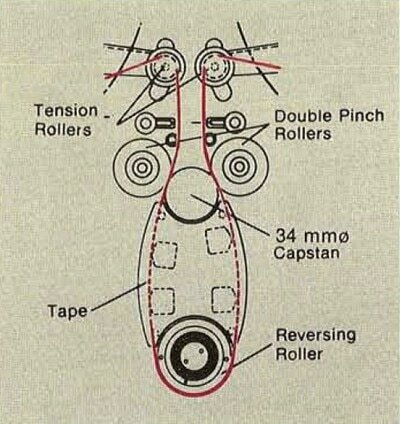 By means of two pinch rollers in contact with the same capstan, an isolated, closed-loop system is formed. The direct-drive oncept was originally introduced by Technics in 1969, for use in high-grade turntables, and was adopted in the Technics RS-275US cassette deck in 1970. 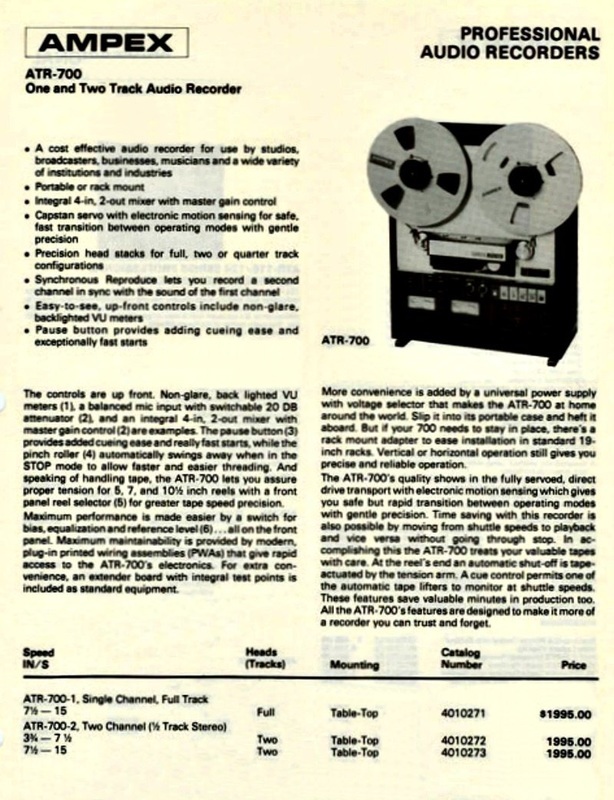 In 1976 with the introduction of the the RS-1500US, direct-drive is applied to a tape transport system (the capstan, flywheel and motor all rotate as a uniform entity) ​The direct-drive principle extends to the reel motors, also. Brushless DC motors of very high torque, with electronic commutation, are unitized with the diecast reel tables. The RS-1500US is designed for 2-track recording and playback as well as 4-track playback of tapes made on other decks. The RS-1506US is designed for 4-track recording and playback as well as 2-track playback of tapes made on other decks. Technical data: Tape speed: 38 cm/s, 19 cm/s, and 9.5 cm/s Frequency response: 30-30,000 Hz (38 cm/s) 20-25,000 Hz (19 cm/s) 20-15,000 Hz (9.5 cm/s) Dimensions 45.6 x 44.6 x 25,8 cm Weight 25 kg. 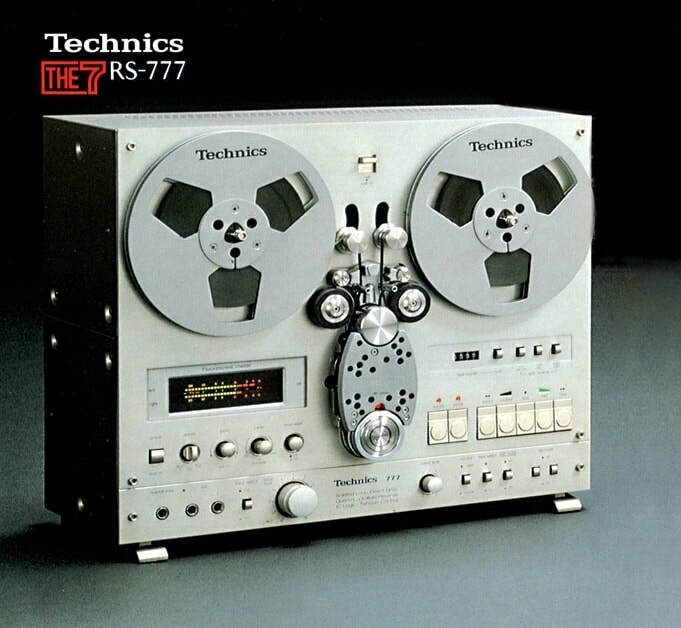 ​​The Technics RS-777 was introduced in 1978 and it was only available in Japan and silver only. In order to offer a more compact reel to reel recorder that can also be used with the mini format Technics Concise components the RS-777 no longer accepts large 26 cm reels. 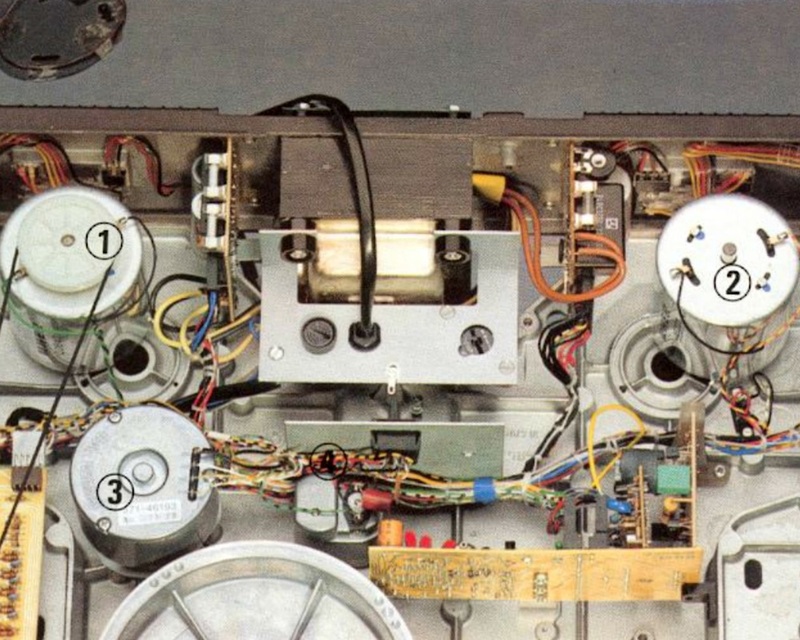 Technics however kept the tried and tested Isolated Loop Quartz Direct Drive tape path in a autoreverse configuration. For this purpose the headblock on this model was the RP-2R2P. 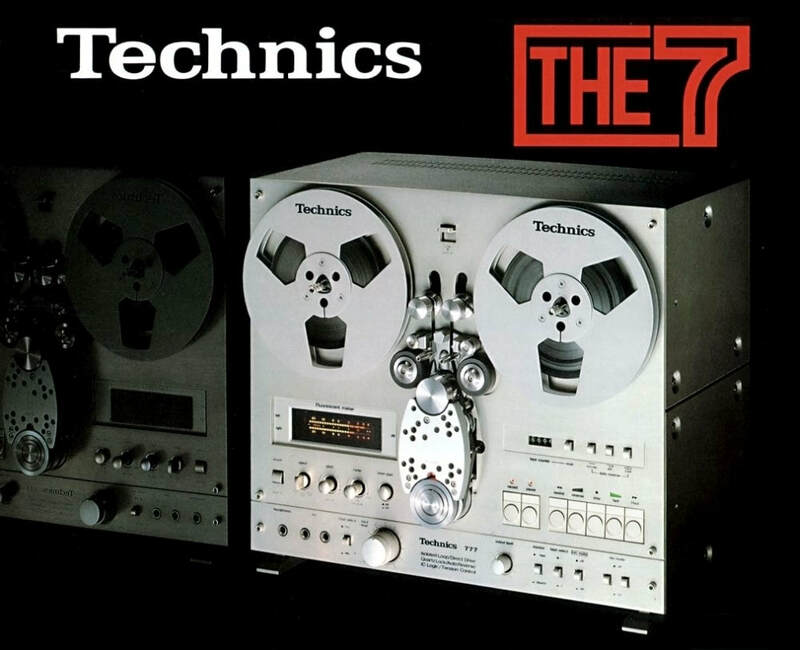 The Tehnics RS-777 also features an "updated" fluorescent tube level meter however the tape counter remained as a classic tape counter. 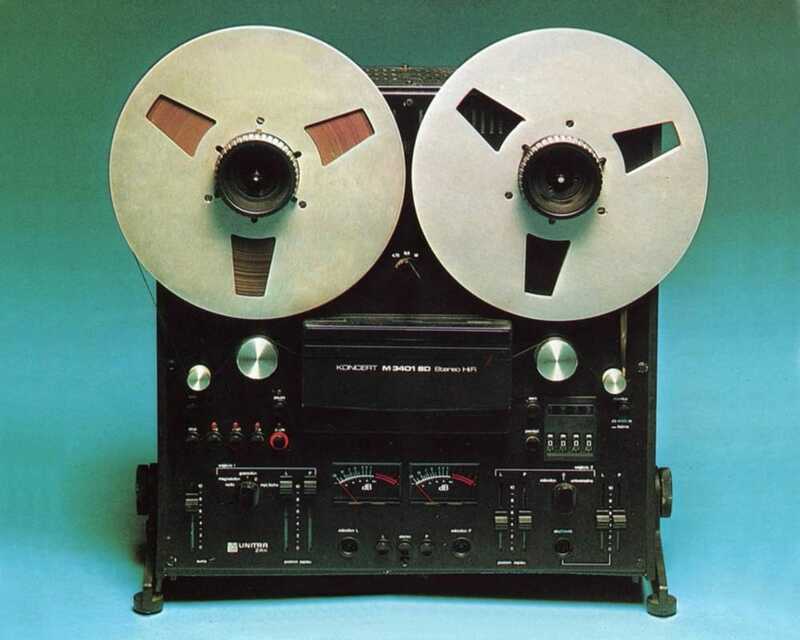 ​4 Track / 2 channel, 3 speed Direct Drive (38-19-9.5 cm/s), Frequency response: 30-30,000 Hz +/-3dB (38 cm/s), Signal to noise: 57dB(JIS), Wow and flutter 0.018% (W.R.M.S), Size: 430(W)x373(H)x259(D) mm, 22 kg. See more UHER in our collection here. 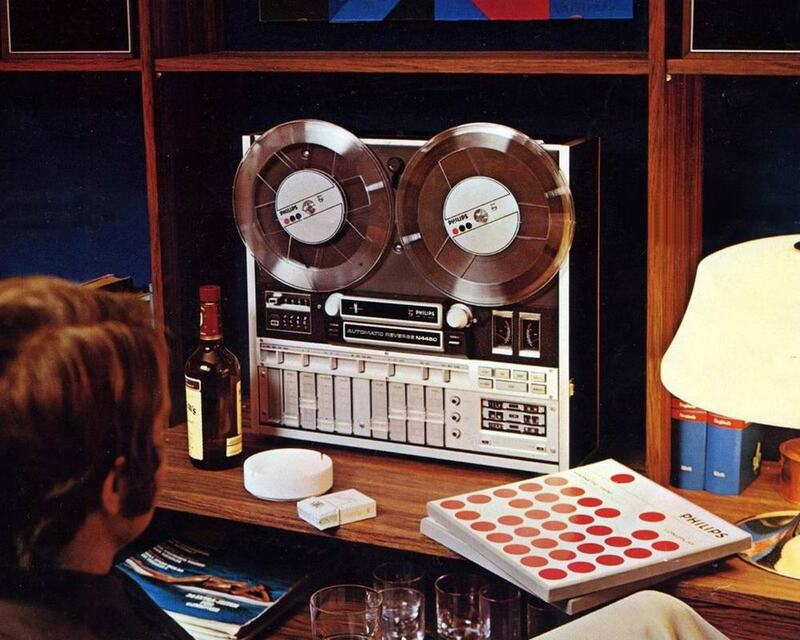 ​King of Polish tape recorders, this is the UNITRA (ZRK) Koncert M-3401 SD from 1979. 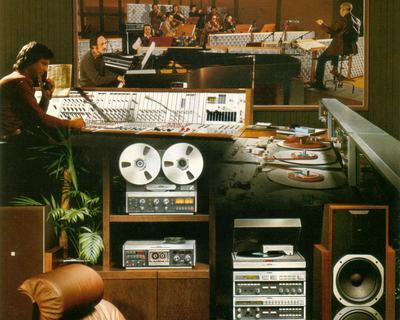 It was available in 3 versions, the two-track model M-3201 SD, the four track model M-3401 SD Koncert and the quadraphonic version M-3404 QD Mozart. This model is built around a 3 motor logic controlled tape transport using a 3 head configuration running at 19.05 cm/s 9.53 cm/s and 4.76 cm/s. 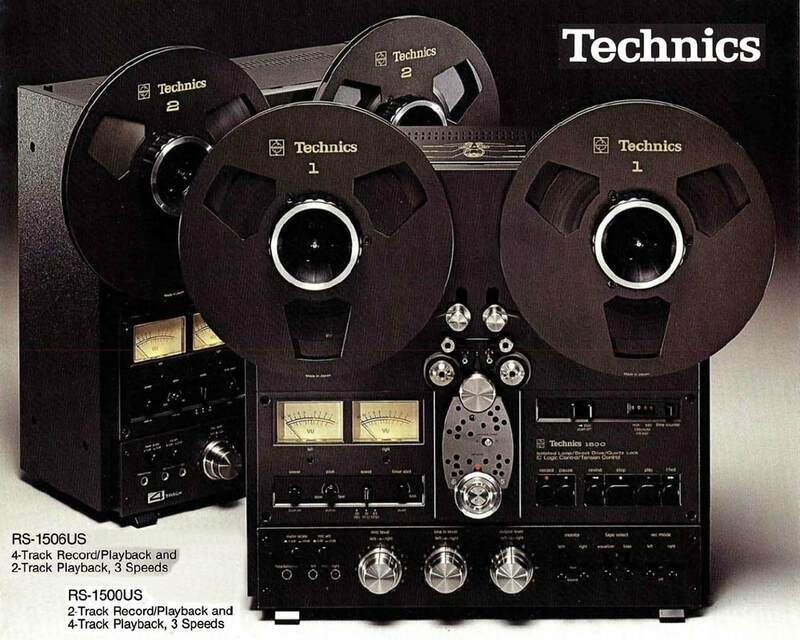 It also features electronic tape tension stabilization. 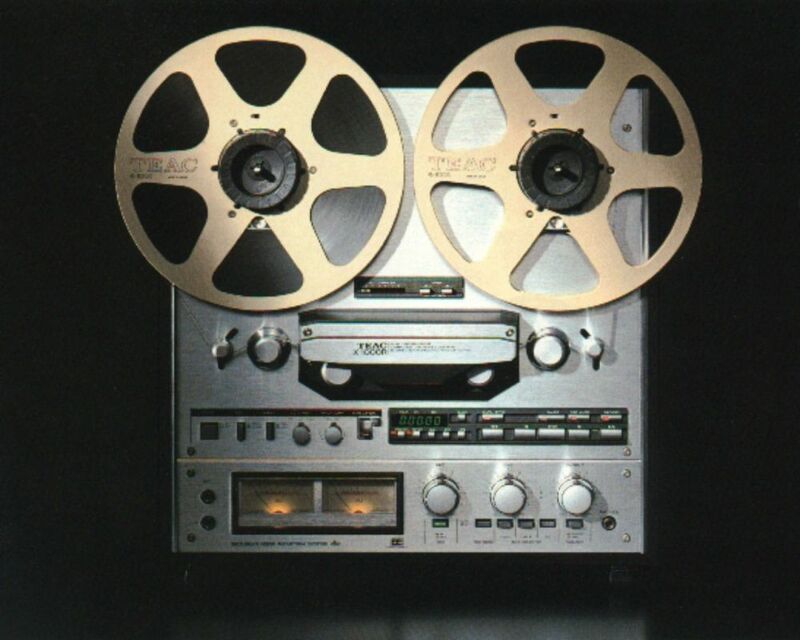 Frequency response is 20-20.000 Hz at 19.05 cm/s with a signal to noise ratio of 58 db. The tape recorder can accept reels up to 26.5 cm diameter. 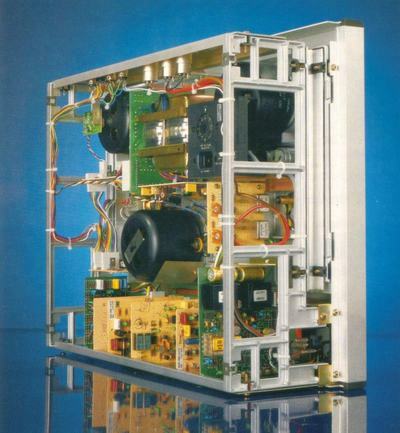 Size of unit is 464x461x173 mm and weight is 20 kg. M 063 H5, M 063 H, M 063 H1 and M 063 HX. 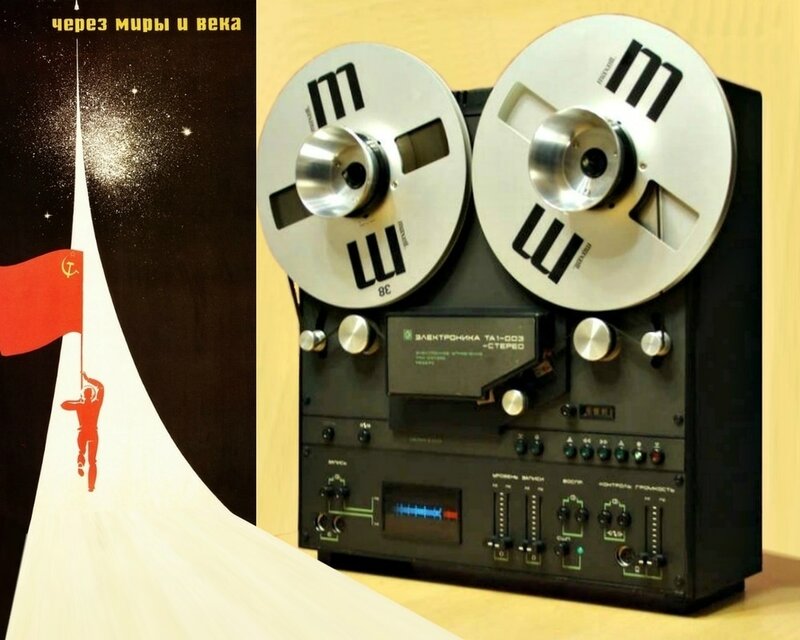 Kostas Metaxas has announced a new tape recorder to be presented as a prototype at the High End Show in Munich during May 2018. 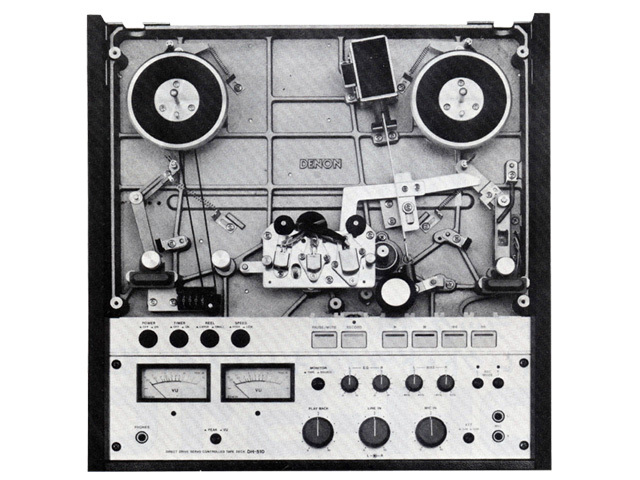 As usual from Metaxas & Sins this tape recorder running at 15 ips only and handling 10-inch reels is shaped more like a "kinetic art object" rather than a usual tape recorder. 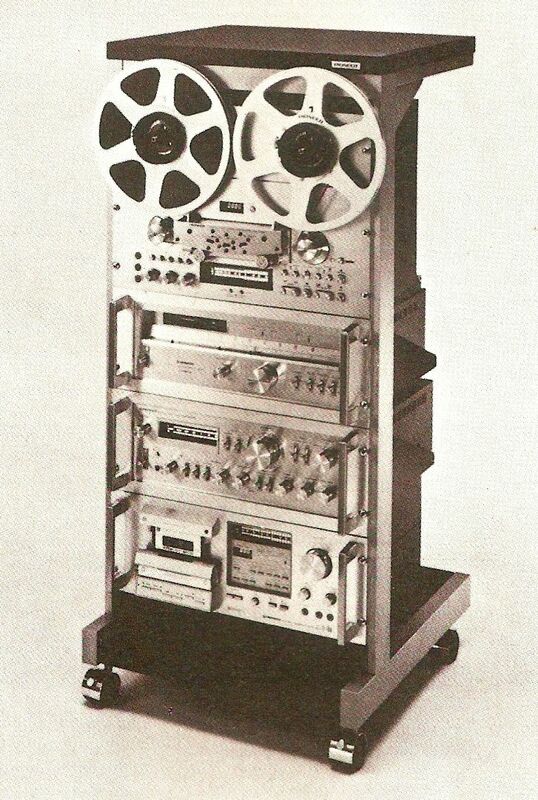 The Metaxas & Sins GQT (Georges Quellet Tribute) is based on the Stellavox SM8 recorder, hence the name, Quellet being the Swiss founder of Stellavox.